Best Western Plus Elizabeth City Inn & Suites est idéalement situé dans le centre de Elizabeth City. Venez découvrir et profiter de notre hôtel à côté des principaux sites touristiques. Réservation au meilleur prix et offres exclusives toute l'année. 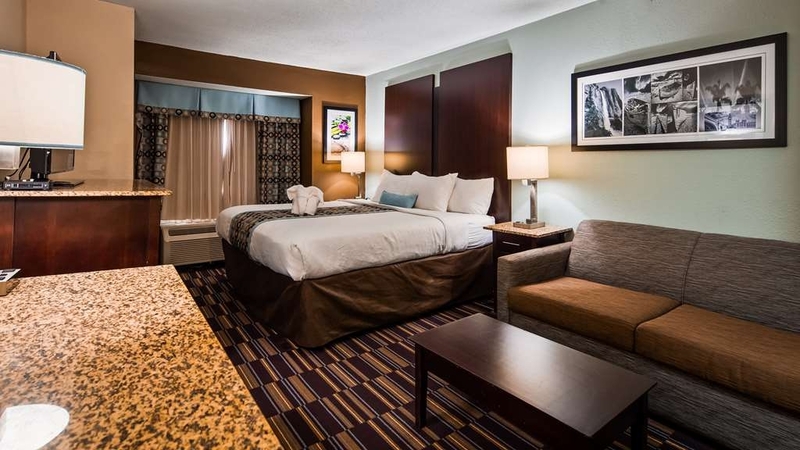 Les hôtels d'Elizabeth City sont proches de toutes les destinations populaires de la région, et avec la marque Best Western, confort et prix concurrentiels sont garantis aux clients. 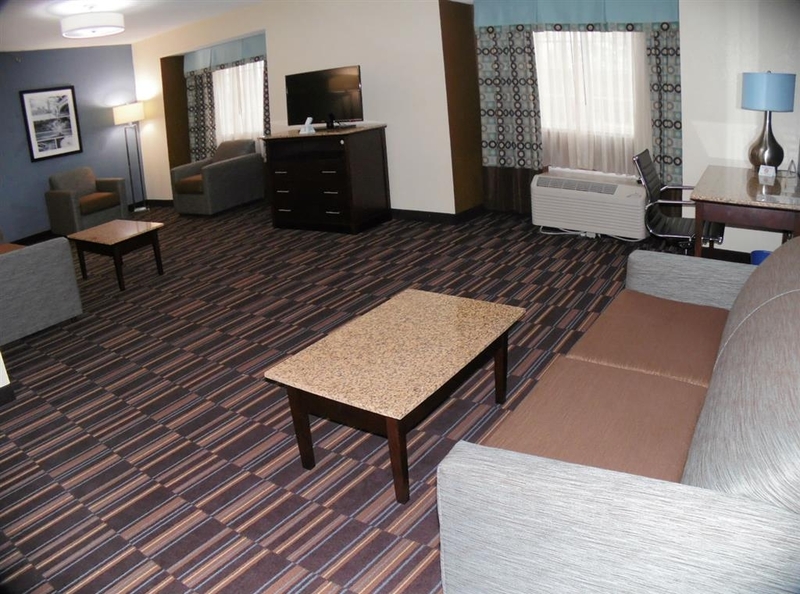 Au Best Western Plus Elizabeth City Inn & Suites, le confort des clients est une priorité. Proches de la base USCG d'Elizabeth City et de la base aérienne d'Air Elizabeth City, nous sommes fiers d'accueillir les militaires et leurs familles. Les hôtels d'Elizabeth City sont comme un second foyer pour un grand nombre de familles de militaires. C'est un honneur pour nous de leur fournir un hébergement aussi chaleureux que possible lors de leurs séjours loin de chez eux. Une piscine extérieure et un parking pour les semi-remorques font partie des quelques installations et services fournis à notre hôtel d'Elizabeth City pour faciliter votre séjour. Rien ne vaut une journée de détente au bord de la piscine, que vous soyez en ville pour une réunion ou simplement de passage. Les routiers et les voyageurs au long cours apprécient le vaste parking mis à leur disposition. Pour couronner le tout, nous proposons un petit déjeuner chaud gratuit composé de mets savoureux, tels qu'un bar à gaufres, des fruits frais locaux et un vaste choix de céréales, pour bien démarrer chacune de vos journées. Les hôtels près des Outer Banks de la Caroline du Nord sont particulièrement recherchés, parce qu'ils permettent des déplacements rapides. Des régates d'été au travail à la base de la garde côtière d'Elizabeth City, les raisons de venir dans la région ne manquent pas. Que vous ayez besoin d'un hôtel proche de l'université Eastern Carolina ou d'un hébergement pour un séjour prolongé avec des tarifs abordables, cet hôtel d'Elizabeth City offre le lieu de séjour idéal. Les voyageurs d'affaires y apprécient particulièrement les chambres spacieuses, et les employés de Coca-Cola® et TCOM y séjournent régulièrement. Que vous soyez là pour l'une des réunions annuelles chez Lockheed Martin ou de passage pendant un road-trip le long de la côte est, vous méritez d'être accueilli avec de confortables matelas à plateau-coussin et une hospitalité typique du Sud des États-Unis. Réservez un séjour reposant au Best Western Plus Elizabeth City Inn & Suites dès aujourd'hui et faites des économies ! We checked in and had wonderful and cheerful service. They even do a guest of the day that gets a fun bag. Our room was clean and service amazing. Then we got to the room and they made an “elephant” with the towels. It's very welcoming! And a great price. Thank you! "They care for their guests"
We recently stayed at this location and was a little disappointed because we were put into the wrong room style than what we booked. We also did not receive a pack and play or crib bed option for our toddler. HOWEVER, the GM emailed us regarding our issues and genuinely apologized and is striving to improve per our review. That action alone was enough for me to change my review to a 4/5 because it shows they truly care for their guests. The breakfast spread had great options and the staff was very friendly. 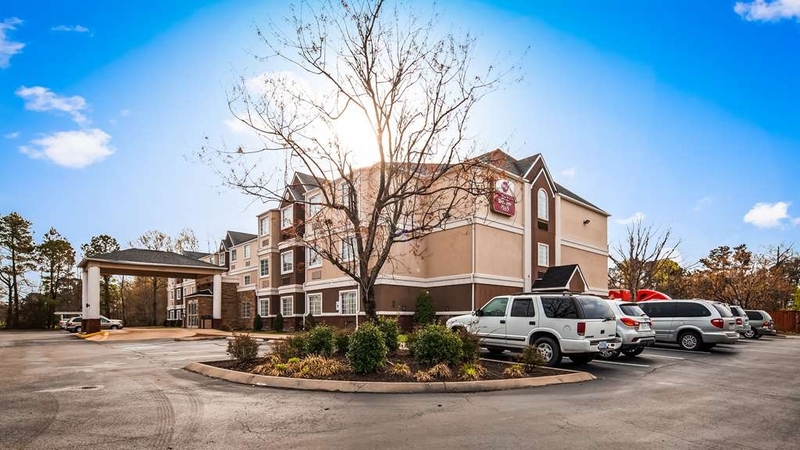 Even though we had a bit of a mix up, we will be back to stay at this hotel when visiting Elizabeth City because it seems like they truly care for their guests and their experience. I appreciate good customer service. Relocating my son for employment, we arrived here after a bad experience. It was early evening and needed a place to stay quickly. I was upset and check in was quick and easy by Shayla The next day we needed to take care of business and needed location referrals, Again, Shayla and another young lady(wish I got her name) were very helpful. Later that day, my sons employer asked where he wanted to stay until his apartment was ready. Of course! Best Western. Shayla took care of everything. We were treated like friends here. Shayla and the entire staff we encountered, Thank You! I'll see you when I come to visit my son! The staff was very friendly. It was a nice stay for the price. Somethings in the room were damaged and out of date, but the cleanliness was good. Breakfast was nice as well and the lounge area is welcoming. 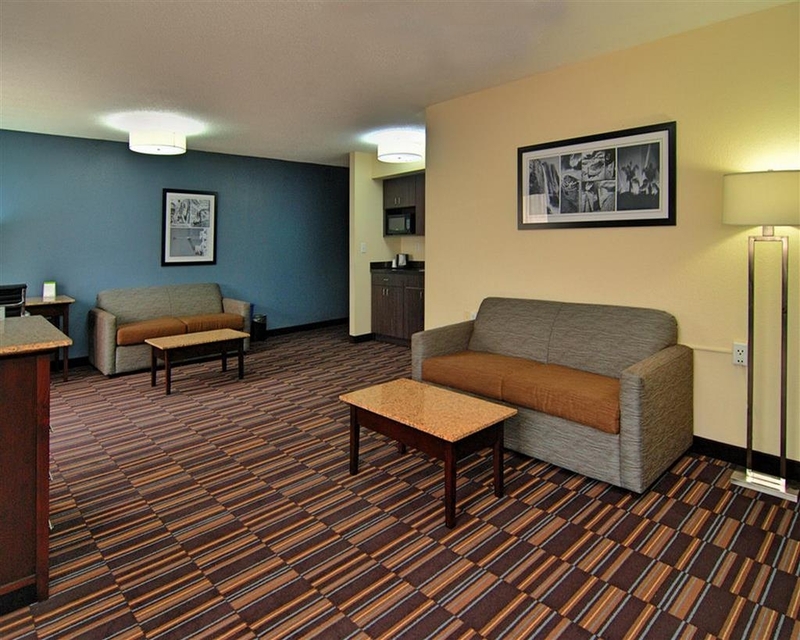 Best Western Plus EC is close to ECSU campus. The staff were welcoming & attentive. We asked if able to use the dining area for fellowship and we allowed (we cleaned our area after Sat night fun). We had a great time in the lobby and dining area. 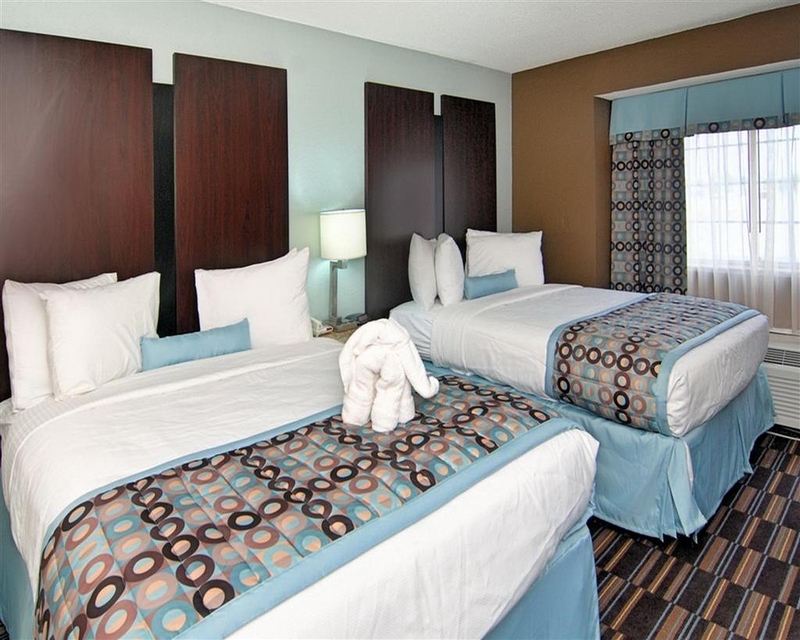 "Nice and clean with very helpful staff"
This was an excellent place to spend the night for two very tired travelers. 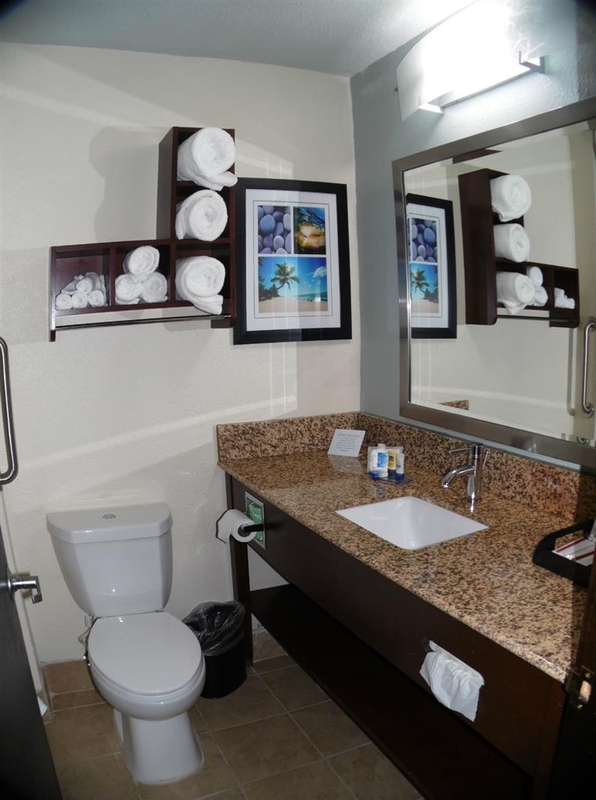 Whole place was clean, rooms were well supplied, and the entire staff was helpful and very friendly. The free breakfast was great; lots of choices and all delicious. "good hotel for the money!" Good decent clean hotel in good location. Hotel staff was very nice. Rooms were clean - beds were comfortable. Very small living room with suites but good when you are traveling with grandkids. Breakfast buffet okay but not great. Our family stayed overnight here as we were just passing through the area. Highly recommend this hotel! Well worth more than what we paid. The staff was amazing and very friendly. It was very clean and breakfast was great. Family reunion everyone was to be on the same floor. I checked in early believing it could not be fixed and my family would be on the same floor but we weren't. I was the only one on a different floor. The refrigerator didn't work. There was a lamp with plug prongs stuck in it. They ran out of towels and gave us pool towels instead. Breakfast repeated itself the whole weekend.. nothing different. Monday just added potatoes. Smoking selection is located right by the pool where it's no smoking (does not make sense). I spoke with the GM thinking she was just the front desk manager and she apologized and gave me a bag of free waters they already give to the customers and never attempted to fix the refrigerator or anything. She did tell me my room could have been corrected. There was a few people who was very nice. 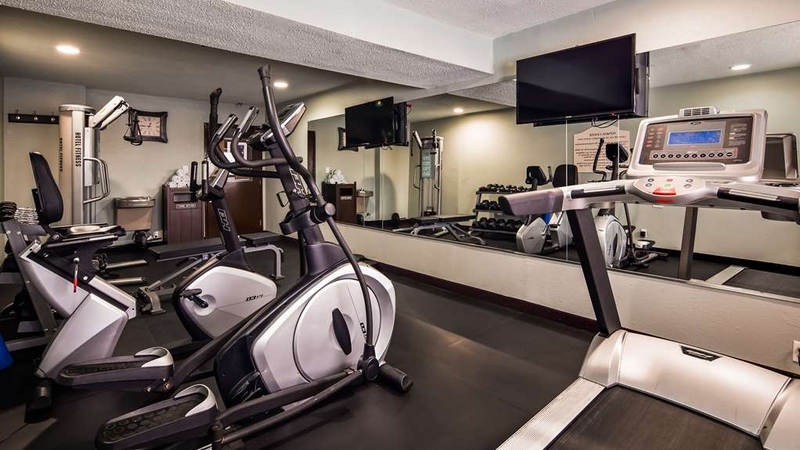 A housekeeper (keisha)who helped us with the beds.. very pleasant and nice and a man (tim) who assisted us in the pool area and also came right up to look at our refrigerator when I was checking out speaking with the REAL front desk manager who was nice. No saying anyone was mean or rude.. there was things that could have been prevented or at least checked on once notified. It's really bad when the GM who is sabrina Parrish doesn't care. We got to hear all about her baby etc instead of her fixing problems in her hotel. As my great aunt is as checking in the GM had her baby on top of the desk in the car seat as one of the associates played with him. Very unprofessional your customer should be respected. 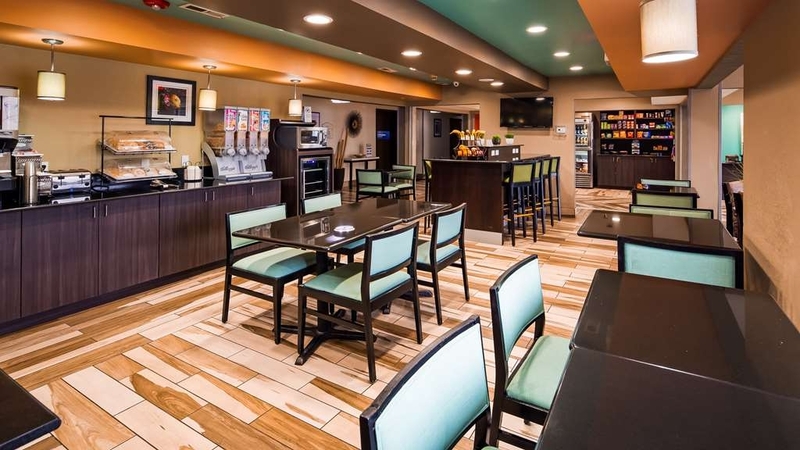 "The Best Experience at Best Western Plus In Elizabeth City, NC"
I stayed for 7 days at this hotel in Elizabeth City, NC recently (August 2018). I would highly recommend this home away from home hotel. From housekeeping, kitchen staff, desk clerk to maintenance guy, all exceeded or met my expectations. I love attention to detail and at check in the guy who checked me in inquired as to if I preferred a room away from elevator or near...of course I selected a room away. No odors or smells encountered. There's a Roses shopping within walking, a restaurant in front with just a few steps away, movie theatre within walking if want to take in a matinee, other take out or dine in(Chinese/American cuisine restaurant, if you like fast food there's McDonald's, Burger King, Chic Filet), other restaurants and especially a seafood restaurant 10 min drive(Quality Seafood) you can eat in take out; call ahead and place a drive thru order just Google Quality Seafood in Elizabeth City , NC. The serenity I experienced was off the chain. Thankful, just plain thankful. There's a waterfront park 10 min away across from a museum. Check in was easy and the front desk staff Christi(I think) was very nice and friendly. Our room was clean and there was a cut little towel animal made on the bed which my daughter really liked. The pool was small but clean and we had it all to ourselves. The continental breakfast was good and was the standard make your own waffles along with muffins, bagels, cereal, sausage, etc. There were also a lot of toppings for the waffles which was a neat addition. What I think could be improved is the timing/location of the housekeeping staff. We ate between 8 and 9am and the staff was pushing the carts right next to the tables in the eating area. It was a bit tight and some of the staff weren't very aware of the proximity of their cleaning supplies and people eating and one staff member spilled toilet bowl cleaner right near where we were eating and didn't acknowledge that we were eating right there. I might suggest that they remove that one little table on the outer edge of the area to prevent patrons from being sloshed with cleaners. Other than that we had no issues. 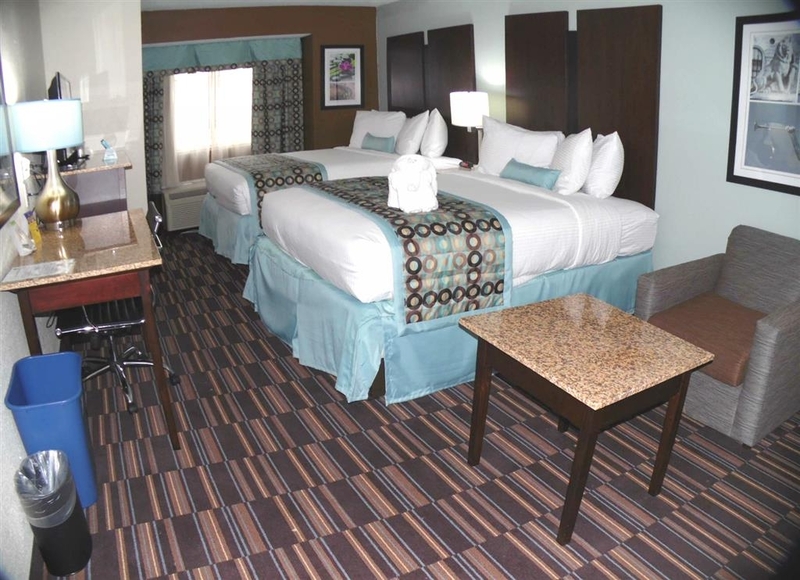 There are a couple of chain restaurants within a 5-10 minute drive and a Big Lots within walking distance of the hotel. "A Nice, Clean Place to Stay"
We usually stay with family but there were too many of us this trip so chose this hotel. It was very clean, quiet, and the breakfast was outstanding! Our room was right by the pool and the lobby but we didn't hear any sounds at all. Very quiet. The breakfast offered hot choices of eggs or omelets, bacon, sausage, and potatos or waffles and an array of breads to toast. Fresh fruits, yogurt, etc also were available. Very friendly staff here and a very positive experience. Plenty of parking and WiFi in the room worked great. I like havin a couch in the room and bed was comfy with lots of pillows. Bathroom pretty small but lots of counter space. We also liked the location right near a grocery store. "My family loved it here, but...."
This should be an almost 4 star rating. I booked our reservation same day but requested a late check-in and surprisingly we were able to check in 6hrs after our check-in time without any trouble. Our stay came with free breakfast, gym, laundry & pool access. I'm very impressed with this hotel but the only problem I had were: -WiFi was suppose to be high speed, but It was only on 1 bar & couldn't access it the whole time we were there. -bathroom didn't seem cleaned. The tub had hairs. Kleenex soft tissue only had one piece left in the box. And the toilet tissue only had less than half roll, I love that they hav this “we recycle” thing but for sanitary purposes opened and used items should be changed and replaced for next customers. "D I R T Y !!!!!!!!!!" went to North Carolina for a visit and was surprised to see how dirty our room was. The floors were not swept, the closet mirrors had hand and finger prints on them , the bathroom mirror had water spots on it AND I found a pubic hair in our sink!!!! Of course we complained and left for a few hours so they could clean it but when we returned, they still hadn't vacuumed the floors. It was disgusting. So again we complained and this time we left a small piece of paper on the floor to see if they would vacuum and we went out to dinner, when we came back the room STILL hadn't been cleaned and we complained AGAIN and said we were leaving. The manager came down and was NOT very pleasant. The girl who cleaned it was also very snotty and I told the manager this, to no avail. I will NEVER stay here again and will NOT recommend this place to anyone. DON'T STAY HERE!!!!!!!! 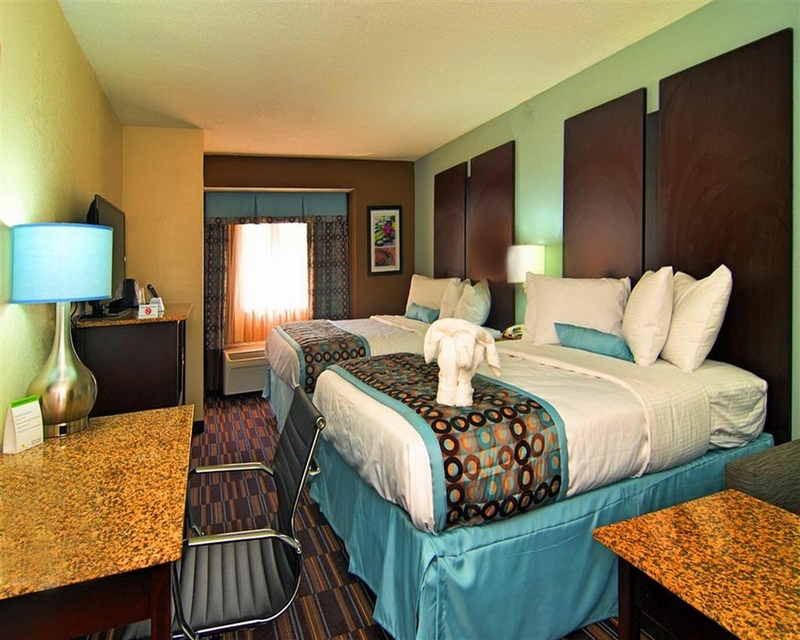 "Great Stay in Elizabeth City NC"
Stayed at the Best Western Elizabeth City NC three days 05/29-06/01. 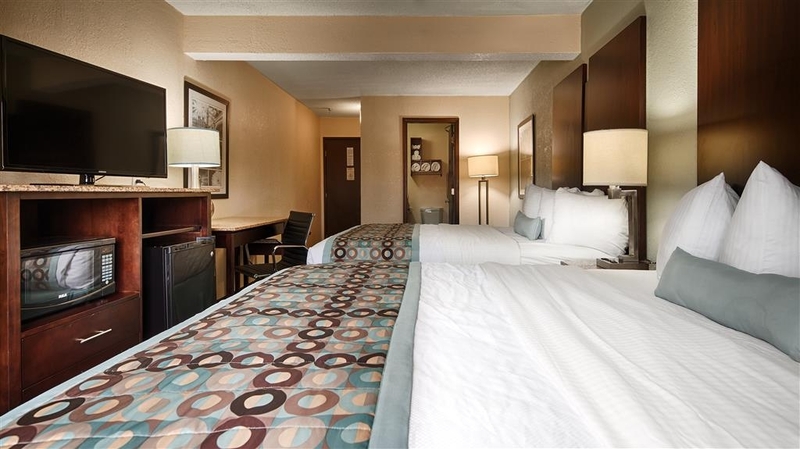 Hotel was reasonably priced and all staff I encountered were cheerful and helpful. Breakfast typical and room clean and comfortable. The lady that checked us in - Christi - was great. She even called our room after our check in to make sure everything was acceptable. Will certainly stay here again on our next visit. 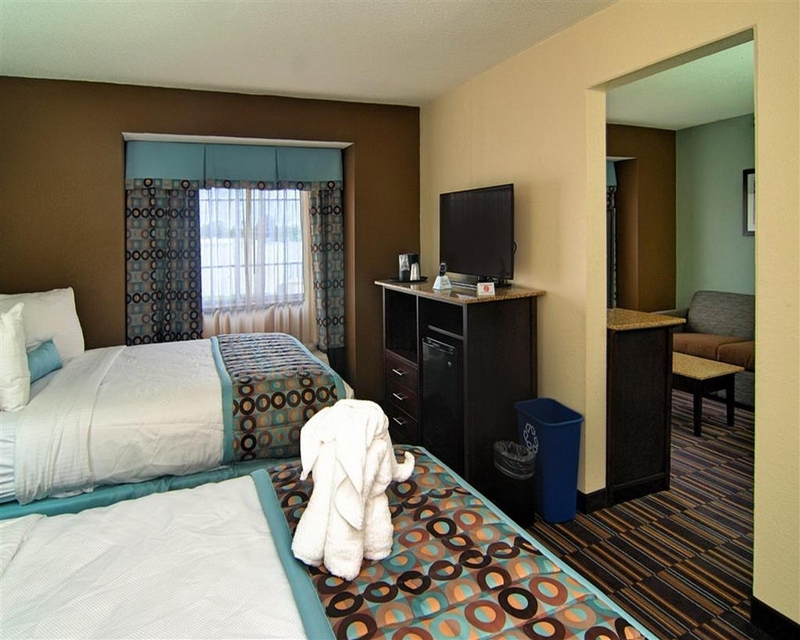 "Stay at Best Western, Elizabeth City NC"
Nice hotel excellent staff! Easy check in and check out. Modern comfortable rooms. Direct TV offered the most channel choices.Good fresh hot or continental breakfast. Super nice lady helps with the breakfast service. I stayed there for 2 nights and visited the Outer Banks in the day between. Very friendly staff, quick check-in and check-out. Room is spaceous enough for one person. Special thanks to the lady handling the breakfast area. One minus: The mechanical function of the bathroom sink didn't work well, water did not flow away, had to remove the plug permanently. I issued a maintenance ticket in the morning but no repair happened when I came back in the evening. Our stay at this hotel was wonderful! They upgraded our room and made us feel really welcome. If you aren't a member of Best Western loyalty club yet, definitely join - they are one of the best we've ever used. 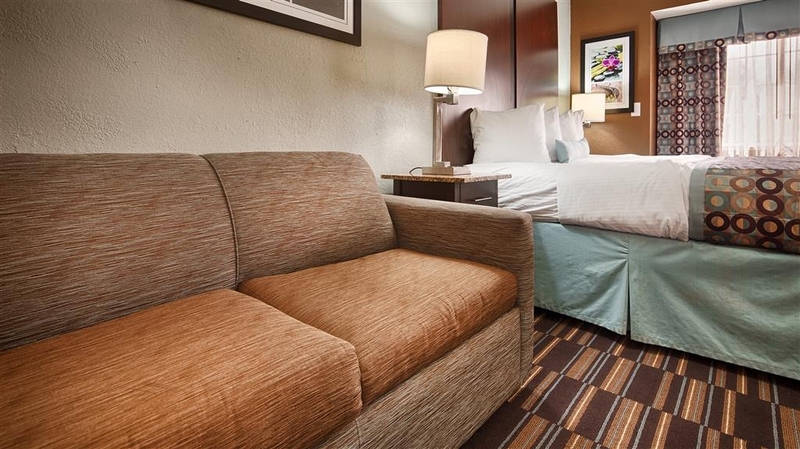 Room was clean and well appointed, quiet and had a great mattress. Breakfast was delicious and because we wanted to leave early they let us come in early for breakfast. Would highly recommend. We were here for a week for work. Absolutely every interaction with any of the staff was wonderful. They are the role model for "southern hospitality". A special shout out to Kimmy who is a real asset to this property. She registered us when we arrived and was so friendly and helpful. First impressions are so important and she couldn't have made a better one! 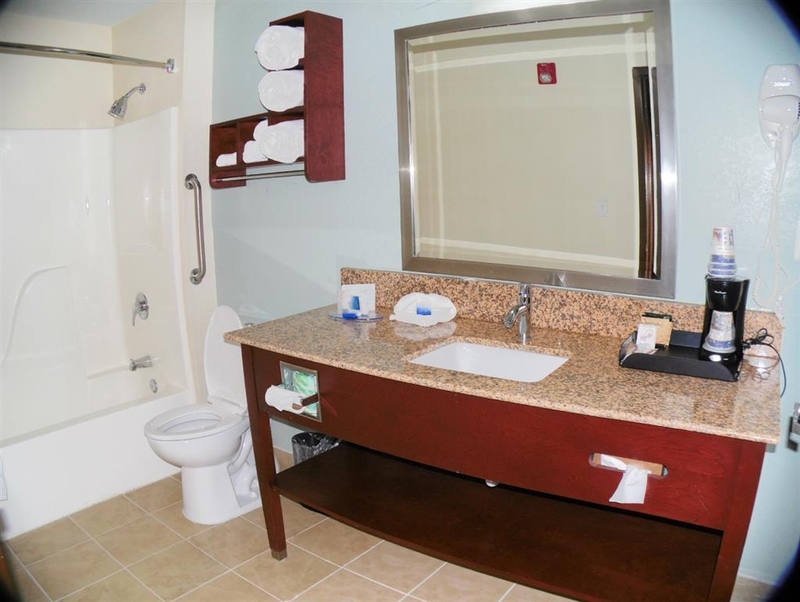 Staff are excellent, very friendly and the accommodations are nice well maintained and clean. I would recommend others to stay as well as I would again as well. By the way, this location offers a military and state/LEO discounts but you must contact them directly for discounted prices. From the moment I called to make a reservation, to the moment I checked out, I felt sincere caring and compassion from all of the staff. Kimberly was who I made the reservation with, and she found out that I was coming for a memorial service for my sister who had passed recently. She booked rooms for my mother and I, and then when we arrived, she had left us a "goodie bag" with a kind note of condolences and some snacks. Shayla was working late at night when we arrived for check-in, and she was very nice and personable. Checking in was very fast, and the rooms were fresh and clean. The next morning, we had a great breakfast, and then were assisted by Sabrina at checkout. The girls gave us a complimentary water, and made sure that we were satisfied with our stay. ALL staff, including housekeeping were very nice and caring. They made our stay a pleasant and enjoyable one! This had to be the most friendly place we've stayed for one night travel stay, everyone greeted and smiled when encountering them. 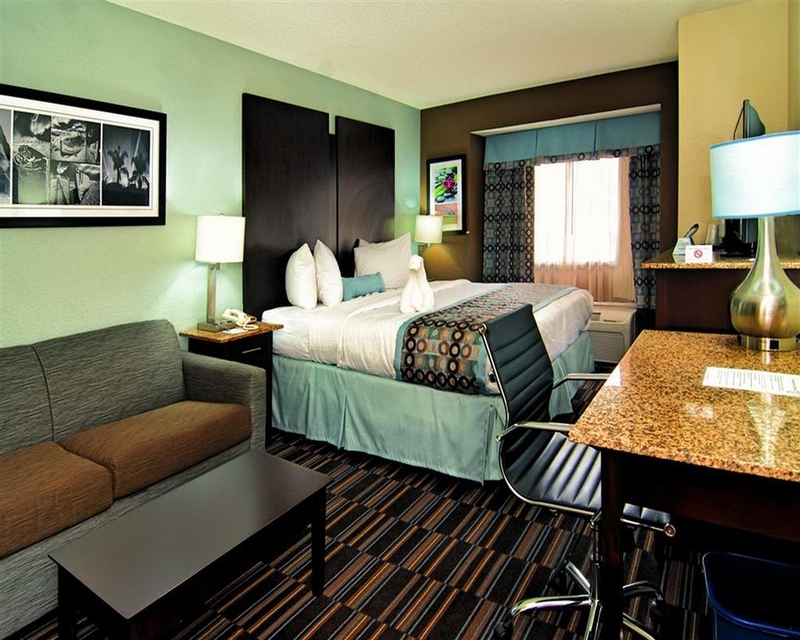 Rooms were updated and clean, front desk very helpful and gave tip on dining and discount related to staying with them. Although did not partake of free happy hour was a nice add-on option. The bathroom was not cleaned. We found broken glass and hair on the floor in the bathroom. The heater wasn't working properly. The room was too warm. We kept hearing noise from the fridge and from the water ruining from other guests. Recently I stayed at the Best Western in Elizabeth City, NC. The hotel was very clean; all hotel staff (front desk,breakfast and housekeeping) were extremely polite and helpful. I would recommend this hotel to everyone in the area. "Very Polite and Professional Staff"
From the time we checked it till the time we left everyone we came in contact with were nice and cheerful and would go out of there way to do what they could to make our stay a pleasant one. For those that are vertically challenged you may what to consider packing a step stool to get in to bed with. My wife 5'1" with a bad knee, it was all she could do to get in to the bed each night. The beds seemed a bit tall and quit firm. If they would have had some squish it might have made it a little easier to get in. "Sabrina and her staff were awesome "
Just spent 2 nights while visiting family; and have stayed here previously. This was another excellent stay! 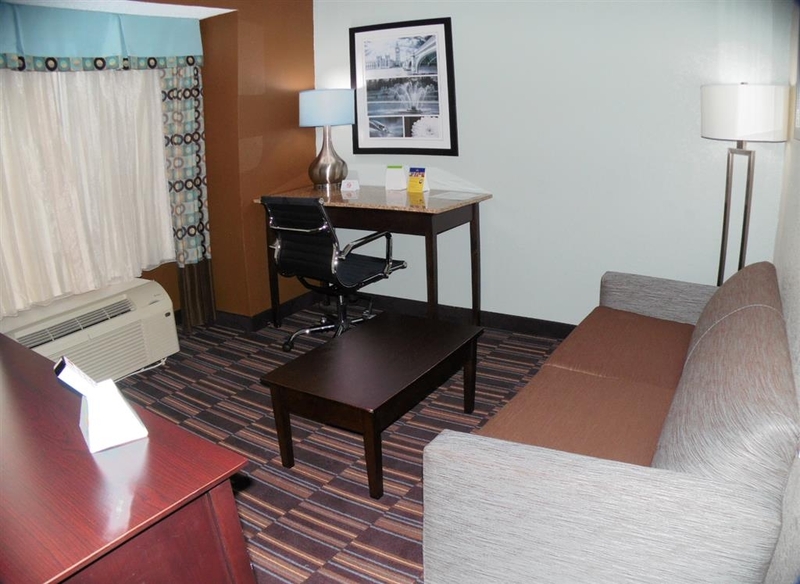 Clean, comfortable rooms and hotel; very convenient to downtown, eateries, retail stores of all types. Plenty of well lighted parking. Very reasonable rates. Melanie's breakfast buffet is comparable to and as good or better than most Hampton Inns that we have stayed in. The Guest Services Manager, Sabrina, oversees a very friendly and capable staff. Will definitely return!!! "Very nice place, extremely nice staff." I have stayed at this location for business, for about a total of 3 weeks straight. I wake up and go to bed, with some of the most friendly people. I caught a few of the names like Tiffany and Shayla, but if I never all there names I would list them. Such a wonderful group of people. As far as the hotel is concerned, you will not find a better one anywhere close to this area. The staff ( and I mean all of them), are as wonderful as they get. 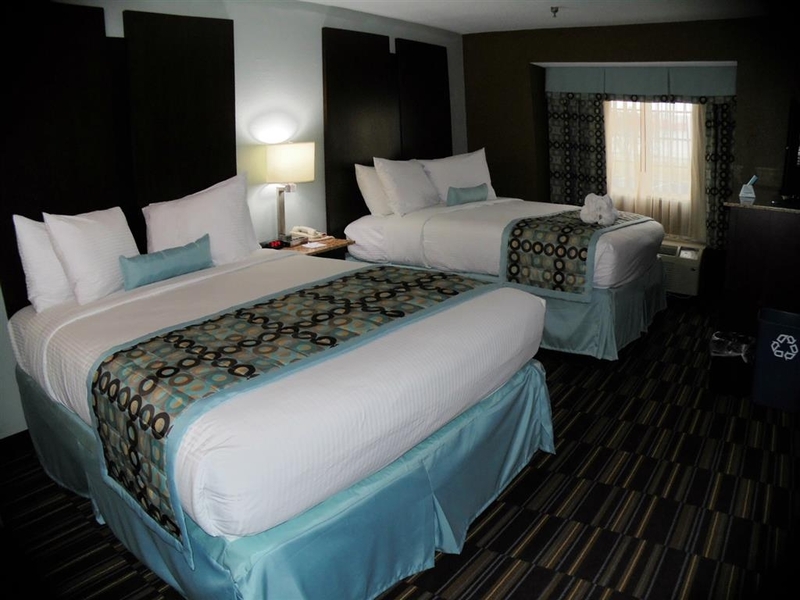 "Very Clean, Comfy Beds, Close to Restaurants"
Great rate for CLC members. 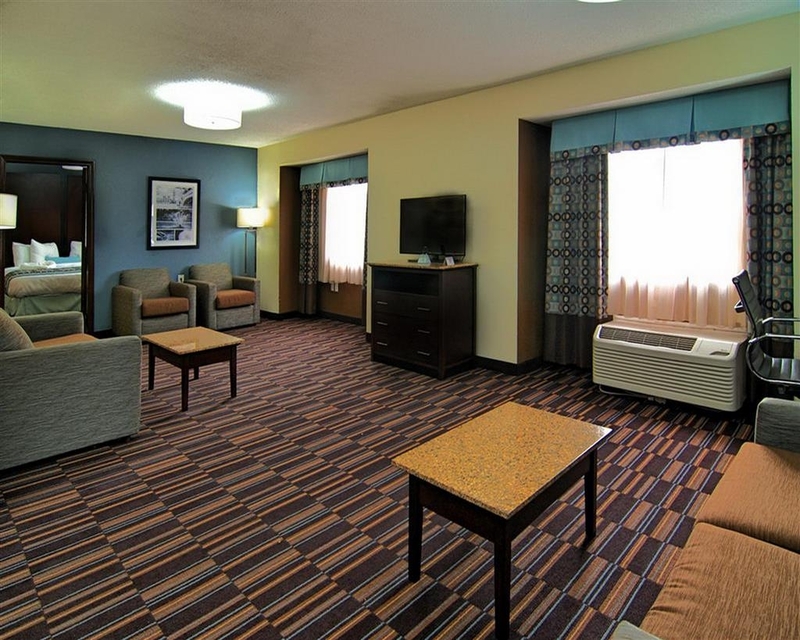 You are sure to enjoy your stay here at Best Westen in Elizabeth City, NC. We have stayed at most of the hotels here in town, and this is our favorite. A Feel Good feeling when entering your room. "Great staff, but old and tired Buffet Breakfast"
I would stay again for the staff and how clean this hotel was, but if you plan to get some breakfast before you go walk past buffet. I would tell anyone to stay for 1 or more nights cause as we know when we travel hotels are scary even if you read great reviews, I always try to not prebook and go direct to property and look at rooms before I rent them and this hotel was great. quality and price very good, staff is great and goes above and beyond. would stay at this property over any other in elizabeth city. breakfast and coffee was hot. very caring staff, always wanting to make sure your stay was great. "Nice hotel for a reasonable price"
Staff was quite friendly & helpful. 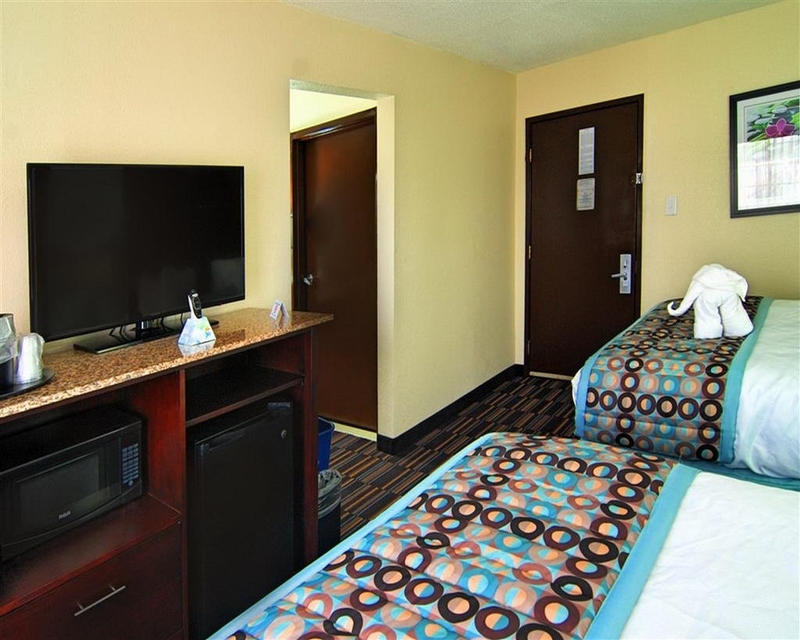 Room had a nice king bed, comfortable sofa w/ hide-a-bed, nice sized Samsung TV w/ DirecTV (! ), a spacious desk, and a modern feel. Hotel was quiet during evening/overnight hours. Parking lot is well-lit, and there's lots of fast food & shopping nearby. Free Wi-Fi was fine for streaming & work (FWIW, it seemed capped @ 2 Mbps), but I honestly used it less than I expected, because of the great amount of (included) content available on the DirecTV box. Free breakfast was nice (wasn't just muffins & cereal, like a lot of hotels do now). I stayed here on business (service call from Raleigh) & would definitely stay here again! Nice room, friendly staff, reasonable price. 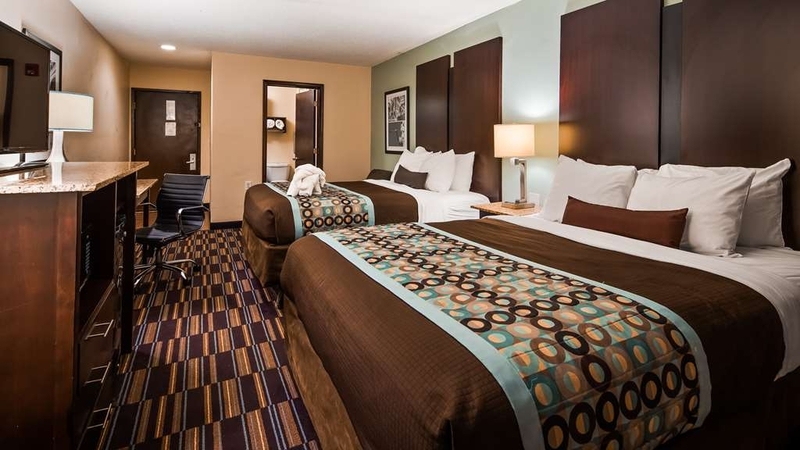 Reserved 2 rooms for softball tournament. Took 3 calls to hotel to get reservation correct. Should have been a clue as to what we would encounter. Arrived after 10PM. Greeting at desk was minimal. Not greeted as a rewards member. Both rooms smelled musty. Sheets were yellowed, couch was stained. Exhaust fan in bathroom was pulled down and hanging from the ceiling. Bathroom so small could not close the door to get into the shower easily. Only good thing was the close proximity to tournament. Definitely overpriced for what they provided. We always stay here when visiting family in Elizabeth City. Our most recent trip was a sad one due to my Aunt's passing on 9/4/2017. I booked a Queen suite for the family and as usual was not disappointed. As always the staff was accommodating, friendly, and professional. I had booked for 3 days but ended up staying a week. They were able to kept us in the same room. 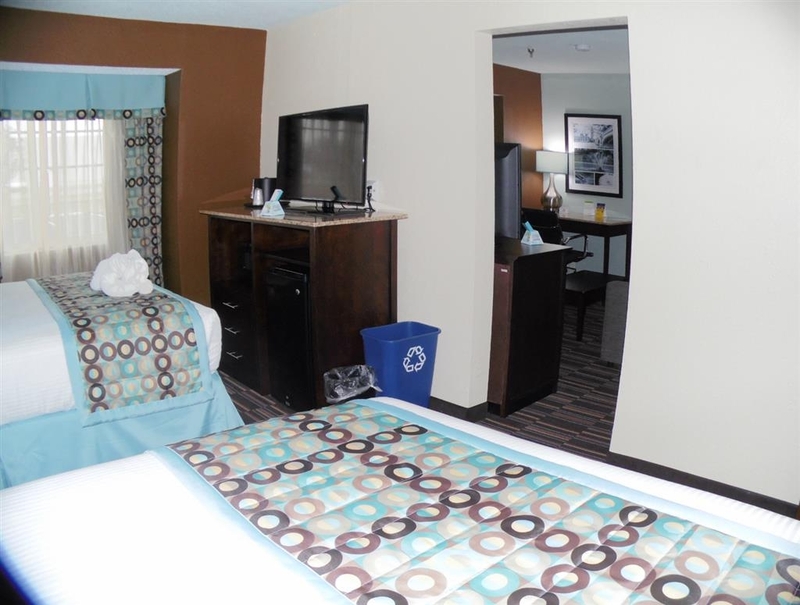 They room as always was clean and spotless and the housekeeping staff was always on point with any request we had. It was a sad time for our family and they went the extra mile to help us! . There was an incident with one of the employees (Tiffany) that I witnessed first hand on 9/7/17. She was very professional and never RUDE to this other guest. I personally was stating an opinion to her when this man waited till I left to be nasty to her. I just want to set the record straight about that incident and praise your employee for her professionalism in handling this guest! My family and I have stayed there for all our trips and will continue to do so whenever in Elizabeth City! The room was attractive, but extremely small. The only place to sit was on the bed, or the toilet! I missed a chair or stool to sit on when putting on my shoes! The bathroom was so smail that the toilet took up half the counter space. The front entrance door is locked at 9:00 pm and if you were coming in after that you had to use your room key. Didn't appear to be any security and the area does not appear safe. Dirty room. Hairs on sheets. Ac unit was pulled apart and not put back together. Pieces on the floor. Pink mold in shower. Keycard for room entry never worked...will definitely not return. Staff was friendly. "Don't understand the bad reviews"
About 50 miles from Elizabeth City by wife decides to go online and read the reviews. After reading the reviews my wife began to check out other hotels until I reminded her that we prepaid and were no longer cancellable. We headed to the hotel, as a late arrival (after 9PM). The counter person was very friendly and accommodating. We entered our room and looked around. It was immaculately clean. I proceeded to rip off the sheets, to double check the mattress, etc. They were clean. We fell asleep right away, I had been driving for 16 hrs and was exhausted. Awoke the next morning refreshed. Proceeded to the free breakfast and made myself delicious waffles. My only negative comment is that they didn't have sugar free syrup, my wife is a diabetic. Overall the stay at your hotel was enjoyable. I do wish the rooms were cleaned more thoroughly on a daily basis. The staff usually went out of their way to help with directions or comments on surrounding towns. I would stay at this hotel again. Location while traveling to OBX was the only pro. Overall cleanliness of hotel was awful. Sink was clogged and maintenance wasn't available so the woman who checked us in came up to fix. Breakfast started a half hour late with many families traveling to OBX and looking to leave early for travel waiting to eat. Hotel needs updates and cleaning. Felt gross to stay there. Never again. Spent a long weekend here for a visit to the Outer Banks. Our room was clean and comfortable. The breakfast was busy but they worked hard to keep it stocked. The hotel met our needs for a base of location. "Don't get fooled.. Don't Stay here at all Double zero rating 00"
This was one of the worst hotel stays ever. The only nice thing was the one receptionist at the front desk that agreed thing we not up to par! Our room floor was damp and had a humidifier in it when we checked in.. The fridge was broken also! The receptionist called the owner and he did NOT CARE!!!!! He cared less about the condition of his hotel!! They moved us to another room and that was only because the receptionist was nice. The workers are nice, but the hotel is not a good place to stay! I would only pay 20 bucks a night to stay here. We have been coming there for years and never had a bad experience like this that the Owner and Management did not care! This might as well been like a quick truck stop! Not worth the money at all! Stay Away! The only good thing were the staff outside of Management and the owner who did not care about his customers.. I reserved a block of rooms for my family's reunion. Out of the 10 rooms we rented, there were problems in about 8 of them. This location has a big problem with mold. When entering the rooms there is a foul, sour, musty smell. Stay away, especially if you have young children or allergies. The staff tried to accommodate us by moving us around but the problem was too big. We selected this hotel because we were going hang gliding in Jarvisburg, and we wanted something north of the OBX as we were coming from Pittsburgh and didn't want to be right on the coastline. We reserved at the last minute and found a room with 2 queen beds and a sofa, which contained a fridge and microwave. We received the room that we booked. The hotel's outside appearance was pleasant. There was plenty of parking. The staff at the desk were great! Very pleasant and nice. We called ahead to let them know that we would be arriving later than planned, and it was not an issue. The room was small but clean, and had everything that we needed. It was quiet. We asked for bedding for the sofa bed and extra towels and were given all items. We did have to go down to the front to receive these, as I'm not sure there was enough staff to be bringing them to the room, but we were making a trip down anyway, and the woman at the desk was happy to get them for us. I had issues with the internet and was not able to access with my laptop. I had no problems accessing with my phone, though. I did not pursue the issue as this was not a business trip for me. Breakfast food was good, but the layout was not the best. The counter tops formed an inward corner, and that's where the toaster was placed, so everyone was waiting in that area for the toaster and you could not access many breakfast items because of the amount of bodies in the way. It interrupted the flow. Also, the toaster had one side which was not functioning, so everyone was waiting on the one working side. The eggs and bacon were good. There were also pastries, muffins, toast and English muffins, and bagels. Yogurt and packaged fruit were in the fridge, and there were some cereal options. Fresh fruit like pineapple, melons, etc. would have been nice. They did have bananas and oranges. There was not enough seating for everyone at the time we went. The breakfast could have been a little better but wasn't bad. The staff was constantly checking supplies and refilling as necessary, and cleaning tables. Really no complaints other than replace the toaster and improve the layout if possible. 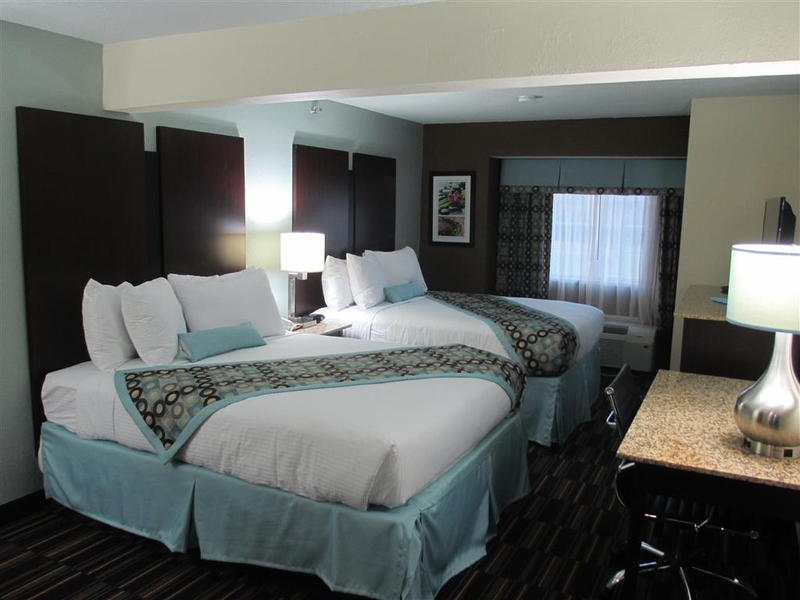 Overall, very nice hotel, great staff who were hard working and nice, clean rooms, had all we needed, breakfast was included, comfortable beds and pillows, ample parking, easy to find. The sofa bed wasn't the most comfortable but was adequate. I would not hesitate to stay there again. "moldy smelling and dirty room, lousy service, all for the price of a luxury hotel"
Due to the evacuation we needed to find a room without reservations. 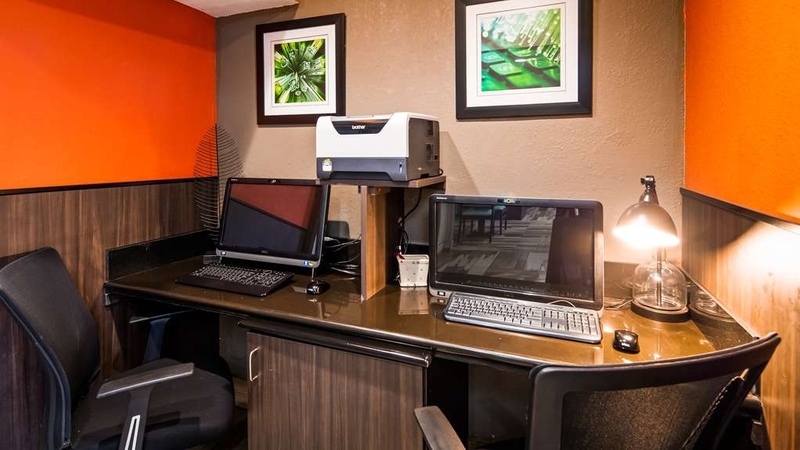 We have been to BestWestern before and always found it to be reasonably priced, clean and friendly. This stay was horrific: overpriced because it was a weekend and rooms taken, the room itself moldy smelling and dirty. Attempting to speak to staff about it proved useless - as they clearly said: this is the last room, take it or leave it. I will not stay at another BestWestern again - this set the tone for how business are not to be run. We picked this location because it was about an hour away from Kitty Hawk, and we were avoiding the ridiculous prices in that area. Though we had only intended to arrive late, go to sleep and head on to our next destination, we ended up checking in earlier because of the storms in Nags Head and Kitty Hawk. 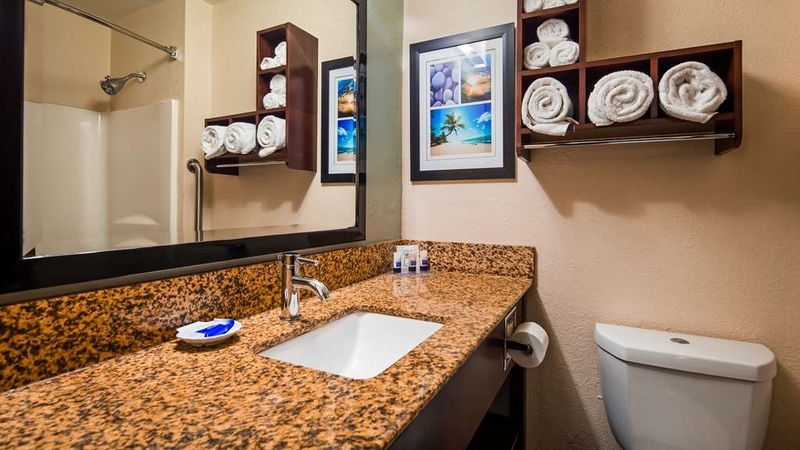 The sanitation rating was 100%, but our room had stained linens, not enough towels for the number of guests, and the décor was really outdated. Breakfast was okay, but not enough seating for all of the guests. It was ok, but our refrigerator turned itself off in the middle of the night, and all of our lunch items that we travel with, were spoiled. The hotel did make that right at checkout. The staff changed the sheets after we found some scum on them but I never felt comfortable that the room was clean after that. Initially the desk agent said there was no housekeeping on duty. I did not like hearing that and to be honest-Just wanted the sheets changed! The hotel was very nice. Easy check in and check out. The breakfast was really really good. The room was nice and cozy and the bed was very comfortable. We stayed here to drive to the Outer Banks because it was A LOT cheaper. My only complaint was that the air smelled a little musty. Clean and nicely furnished room. Pool. Breakfast was very good with plenty of options and definitely an added plus. Quite a drive to Outer Banks from here...but better than paying Outer Banks hotel rates. The staff was very helpful, but the overriding issue of the stay was the odor in the guest rooms. Very musty/moldy smelling, with notable mold/mildew growth in the bathroom and air conditioning unit. If you have any allergy/asthma sensitivities, beware. Staff did their best to correct the issue (put a dehumidifier in our room, odor neutralizer, etc) but it could not be eliminated (and was the same in 4 other rooms we were able to check in an effort to switch rooms). The stay was great. Staff was awesome. Only complaint was the breakfast area was way too small. We have an infant and there were only a couple tables that were always busy. Other than that the experience was very good. 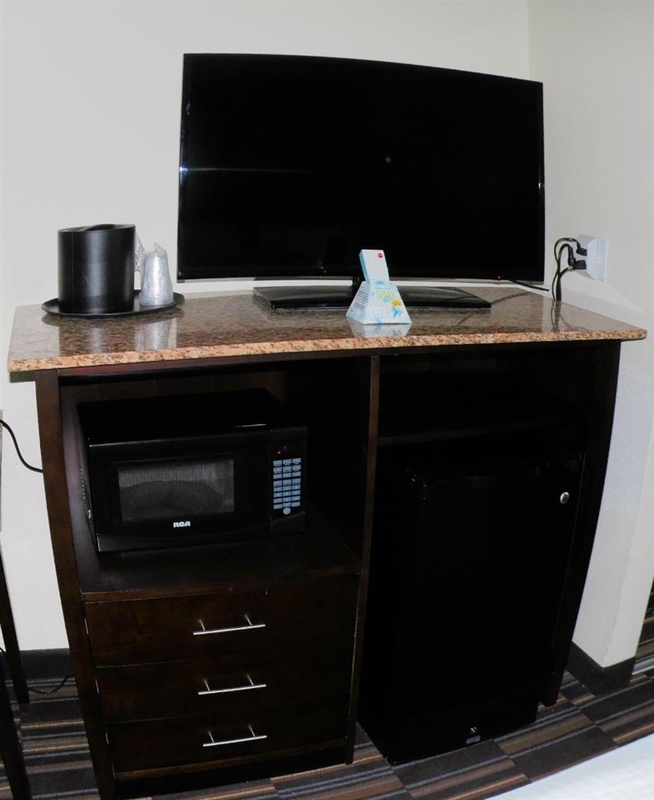 "Rude Service/hot hallways/ low pressure"
After returning to my room 3 hrs after reporting some issues (tv and telephone inoperable) the items were not corrected and I was rudely told by the desk attendant that it was not her fault. She should have kept up on the situation and ensured the items were corrected. The hallways are damp smelling and hot. The elevator is jerky. The water pressure in the tub and shower are low. The room was clean and the bed was comfortable. If you want to listen to the employees complaining and cussing about the customer. This is the place to go. The front desk didn't believe me when I said it looked like someone had been laying on the bed. After tell me that the all sheets are just wrinkled, they came to see for themselves, and all they did was straight the bed up. With an attitude one asked do you want to change your room. Customer service needs training. Then after entering the lobby I called back to the room to tell them that they had guest waiting to check in, there was no one at the front desk. 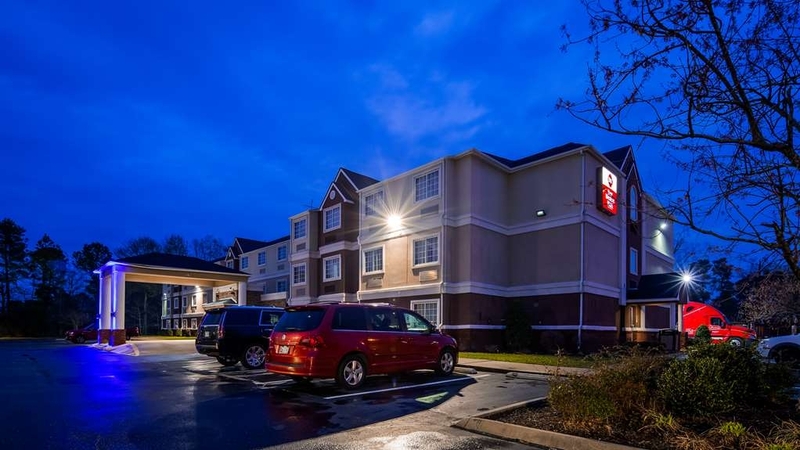 "Great location before OBX vacation"
its a nice hotel and good breakfast. Very helpful staff. 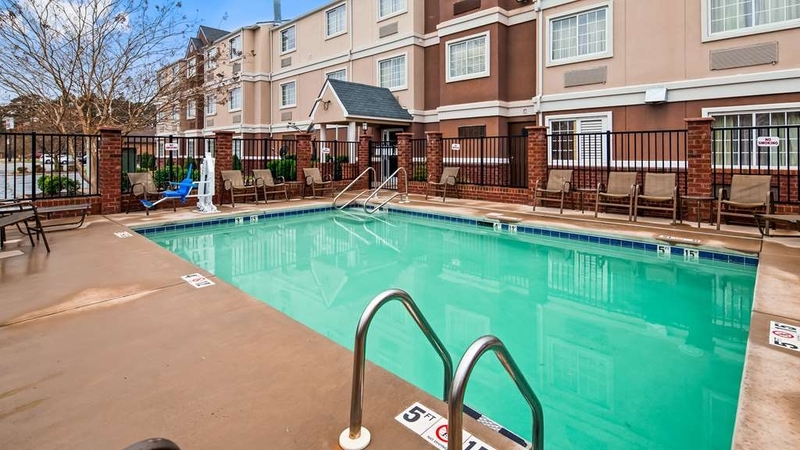 I have stayed in a few place in Elizabeth City and for the money this is the best value location. Only a few things keep it from very high ratings. Some of the office chairs in the rooms can be damaged and tilt and internet speeds are not very high. 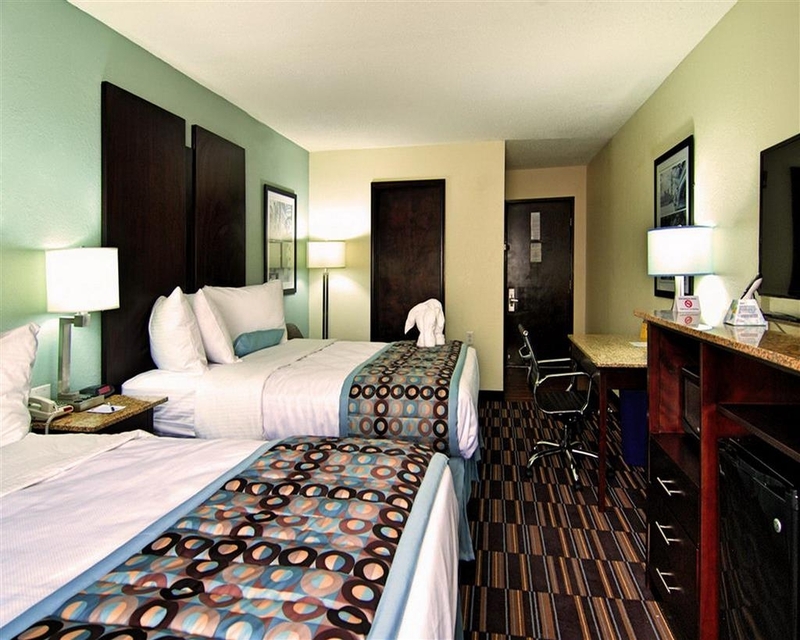 They keep it clean but on occasion the rooms can have a little odor but not to the point of stopping a relaxing stay. The hotel is going downhill. It's filthy. They're is mildew called on the shower head, the rooms smell awful and the shower curtain had blood stains on it. We waited 5 minutes for someone to come to the front desk to check us in. We even called the phone in the hopes it would draw someone out of the office. After several calls, a girl appeared as if she had just woken up. "Adequate but a bit shabby"
Quiet, comfortable room, as requested; polite staff. Breakfast of dehydrated fried eggs not very appealing but there was a choice of breads and yogurt also available. Overall, just a little run-down. Thanks to receptionist for recommending Cypress Grill for supper. Good for a stop over but a little over price,. for the location No desk in room. Staff helpful room clean building has seen its better days. Location facing the side of a business. Makes you feel like you are in the warehouse district. Breakfast is the usual not bad but nothing special. "Nice Hotel but front desk staff practically non existent"
We arrived to check in at the hotel after 8pm on a Friday night only to wait for over 5 minutes for someone to come to the desk. There was no staff person in site which was a little annoying considering we had been traveling all day. Finally a woman came to the front and was very friendly and helpful. Our room was clean and comfortable and quiet. The water pressure for the shower was not the greatest but not a deal breaker by any means. We went down for breakfast the next morning and they do have a nice variety of items and the staff was around to keep it full and clean. When we went back to our room both of our keys had been changed somehow by the computer. Luckily for us there was a housekeeping person on our floor who let us into our room. When it came to check out once again there was no staff in sight. I guess if you choose to stay here you should opt for an express check out. Maybe that bypasses the front desk. I guess overall it was a good place to stay as far as being comfortable and quiet. I just hope you don't need anything from the front desk because you may have to wait a while for someone to attend the desk. Room was good, staff was fine, bed was comfortable and we slept well. A storm came through in the early part of the night and being on the 1st floor, wind in the hallway caused the door to sound like someone was trying to get in. That scared us, but once we realized what it was and made sure the door was secure, we were fine. The breakfast was good albeit the line for the breakfast due to waffle iron placement on the counter was a bit difficult to get through. The hotel is in a good proximity to various restaurants so there were close by food options (you should try Montero's it was close by and delicious.) 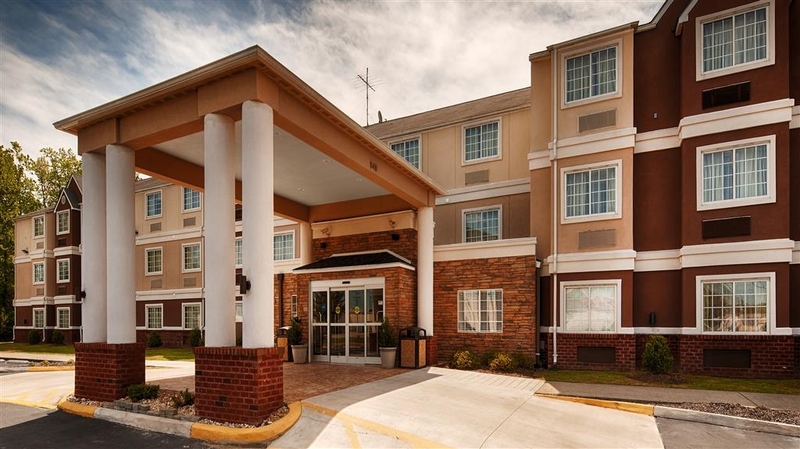 Overall, if you're passing through Elizabeth City, this is a good and safe place to stay for a night or two and we would choose this hotel to stay in again if in that area. I stay at this property on average about 6 nights a month for bussiness. The staff is always great and very accomomaditing. Nicole and her staff are great. I will have to try the happy hour as the last times I missed it . If it is any thing like the breakfast it will be great.The breakfast is always been very well presented and maintained. 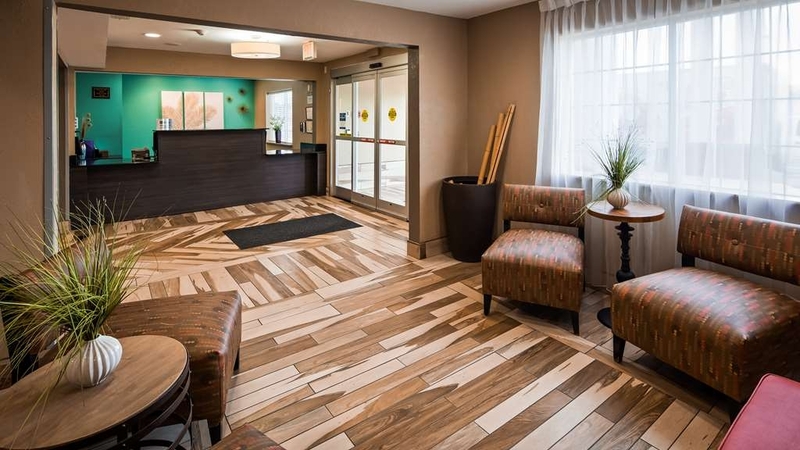 "Great Staff, Very Professional, and Kind"
The Staff was awesome, the overall experience inside the hotel was good. I was here to bury my father. Only bad thing about the stay was coming in at night and you see groups of drunken construction workers in the parking lot..
My stay at Best Western was great! The room was very clean and it had really nice furniture. The staff were great especially the front desk service from Shayla and housekeeping service by the Manager Kashara. Highly recommend this hotel!! I have been staying here for some time and I have always had a pleasant stay with the hotel. The manager Nicole have always been real nice and I look forward to my stay again. Breakfast has been on point and also the happy hour is always a plus. The room is always clean and smelling good. Thank you so much for taking the time to review us. I am so glad you are enjoying your stay. It is a real pleasure to have your business and thank you so much for your loyalty to our brand!!!!! "Sheets with stains and smoke smell"
Whenever I stay at any hotel, I would check the sheets, bathroom, and towels. When I pulled the covers back on this bed, I was in AMAZED. There was a blood stain in the middle of the bed. Upon walking into the room, I could smell smoke in the room. Even though this is a smoke free hotel. The toilet had a ring, it look like some mold. I requested for a refund the staff members said I could not be refunded my money. They moved me to another room. This room had a smell and again a ring of mold around the toilet. Hotel as an absolutely awful smell. Staff said nothing could be done. Had to go to local Walmart to get Lysol and used entire can for 2 nights. People with allergies or asthma PLEASE beware. NO LATE CHECK OUT. Checked out two days ago and am still appalled at how filthy my room was. Had I not arrived so late and had to leave so early, I would have high tailed it. Totally not like BW, I've stayed in several and they area usually perfect and immaculate . Let's start with the smell upon walking in the room; ok, not the first time I've had a musty smelling hotel room, not the end of the world. Then, noting the carpet had bits of who knows what all over the place, I began to wonder when it was last vacuumed. Next, there was someone's spit on the mirror from brushing their teeth, funk around the faucet, switch plates I did not want to touch, a puddle of oily Lord-knows-what on the night stand next to my bed, thick dust all over the lamp, a shower so dingy I was scared to use it. Luckily I was there for an athletic event so was able to get away without a shower (eew). Coffee maker; a few packets of this and that just thrown on the tray. If you've read this far, here's the best part, I stepped in a squishy, sticky, wet puddle of I-don't-want to-know right next to the bed. Upon further inspection, I found some change, stacks of dirt/dust, tags from new clothes. Really??? I'm still scared to death that I brought home bed bugs or something disgusting. Finally, did the clerk ask me how my stay was at checkout? Nope. Probably a good thing, I was furious when I left...NEVER, EVER AGAIN! 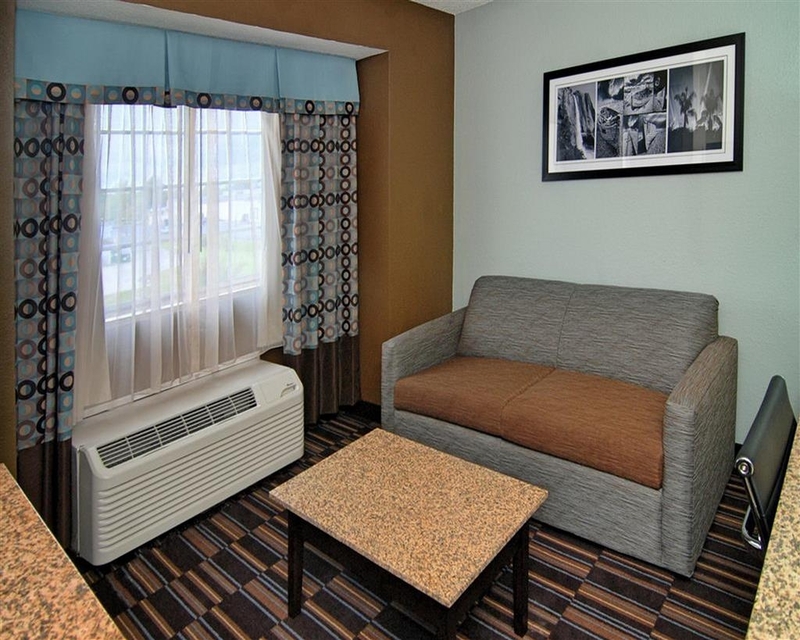 Good value for hotel near ECSU. Great breakfast. I would prefer firmer pillows but bed slept well. Great distance to ECSU. We enjoyed the separate Living Area & Sleeping Area layout. Enjoyed mini-refrigerator & microwave in the Room. 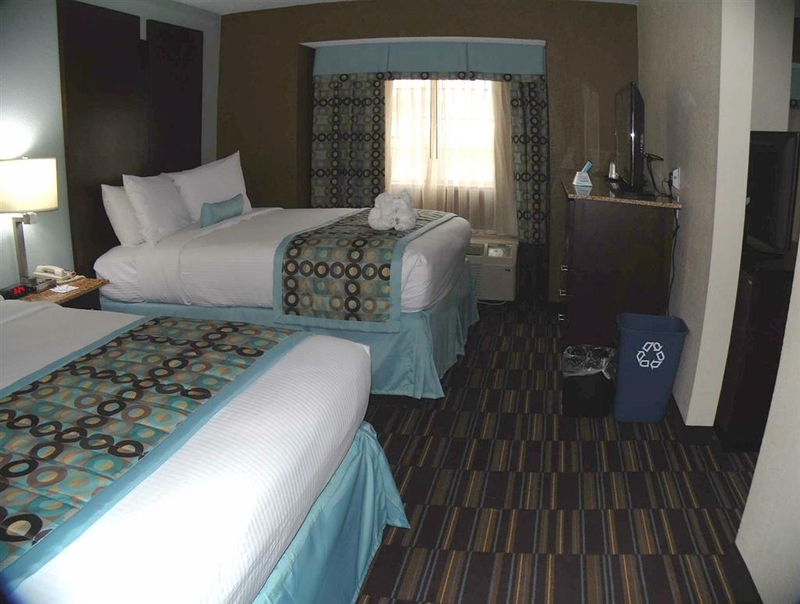 The room was clean and staff was professional and friendly, but the quality of the room was not very good. The tv didn't work, the ventilation fan was loud and you couldn't have the light on without the fan on as well. "Nicole and her staff are awesome"
I have stayed here several times for work. I believe this hotel is a little overpriced since I spend 5 days a week in hotels away from home every week for the past 5 years. I do recommend using expedia, some other travel site or coupons available at most rest stops. You can easily cut 20-30 dollars of the hotel rate. This being said, the staff was remarkable and the breakfast was exemplarary. Comfortable bed, and all items in the room worked with no issues...well except for the TV. There were too many channels, I fell asleep before I could explore them all. Very comfortable rooms and quiet surroundings contributed to a pleasant stay on Christmas holiday. Staff was very helpful. when I needed extra towels, and helped clarify billing even though it was late in the evening when we arrived. They helped us modify the online request for rooms and change it for a less expensive alternative. This motel was very clean and fresh smelling. No issues with the room or any ugly smells. The staff was friendly and helpful. We didn't hear any extra loud noises from outside or the hallways. We will be staying here again. My family (4 rooms) stayed here for 2 days. 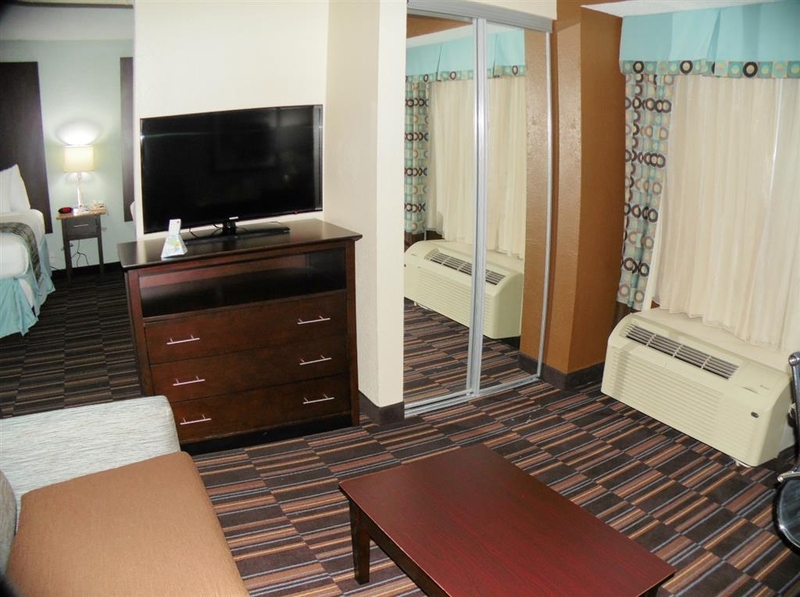 I have stayed at Best Westerns before and was hesitant to stay here because of that. They are typically clean but hover between average and slightly below. I wanted something nicer for my semi-large group. After looking at the pictures online and reading the reviews I decided to give them a try. I must say that I was pleasantly surprised by the overall experience. 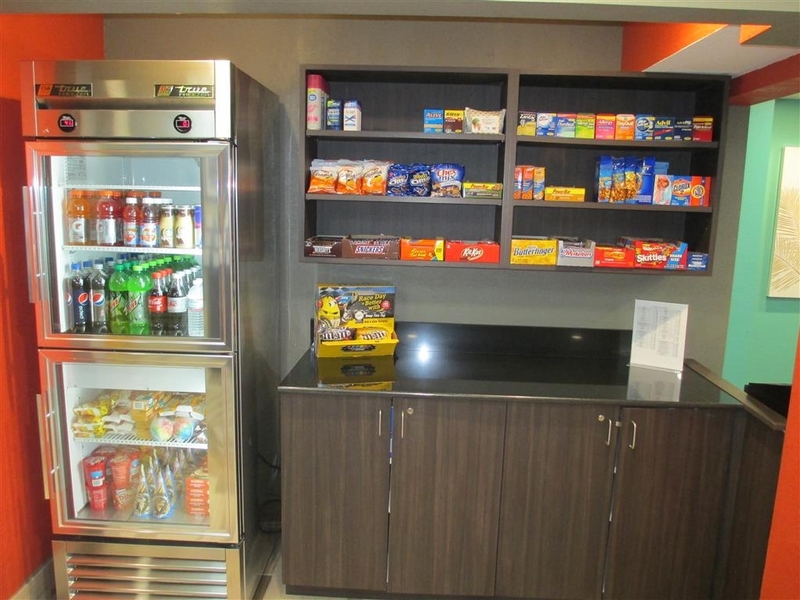 The building was obviously recently renovated and had lots of new touches to make for a better experience. The staff was friendly and always present. I rated this 4 stars because the fan in my bathroom didn't work and BOTH waffle machines didn't work one of the morning we went for breakfast. Spent 1 night here. No big problems, just a few small ones. The rug was dirty and you left black footprints in the shower. The bathroom is dark, it needs brighter lighting. Location is good, east enough to find. Places to eat and shop are close by. When I checked in I used a $50 Best Western travel card. The desk clerk said she had it and would take care of it. When I checked out in the morning I was charged full price. The young lady behind the counter said she could see the card, but it was not applied to the room. I was told her manager would have to fix it. Staff members should know how to use these things. I would not have a problem going back. My daughter and I were just traveling through on our way to Orlando. I usually stay at Best Westerns when ever I can and am very seldom disappointed. This was the exception. The bathroom floor was filthy. I scrubbed it myself before i would let my daughter walk in there. The office chair was broken and so was the door handle to the room. I went to the 2nd floor to get ice and the whole front of the ice machine fell off into my hands. We did eat at the complimentary breakfast and it was OK, pretty much standard. "Bad experience in Elizabeth City, NC"
Hotel room was small and cramped--couldn't hardly move around. Musty smell to room. Dampness in room was so bad it penetrated our luggage and some of our items were damp and we had to lay them out to try to get them dry. Stayed with the family while heading to OBX. Upside: Clean and safe, newly remodeled (although I agree they should fire the designer) and convenient. Breakfast was typical and free 24/7 coffee. Downside: Not overly friendly, pool is very small and placed by the dumpsters which smelled pretty bad. Many of the fixtures in the bathroom where broken, including the shower handle. Also, no hot water. Overall it met our needs of a convenient spot to sleep for a night but that's about it. "Wouldn't go so far as plus..."
Needed a hotel to house the 5 of us while traveling to the obx. Thought the idea of a suite with a sofa bed would do the trick. It was a tight squeeze for us which was okay but the rooms need a good clean. Sofa bed didn't pull out correctly so we had to lean on it to open it. The sheets for the sofa bed we got was a flat sheet and a blanket. Hoping the blanket was clean (not really thinking about it...). Breakfast was not so good-powdered eggs. The beer prices at the front desk were fabulous though as were the clerks at the desk. Don't think we will return next year. 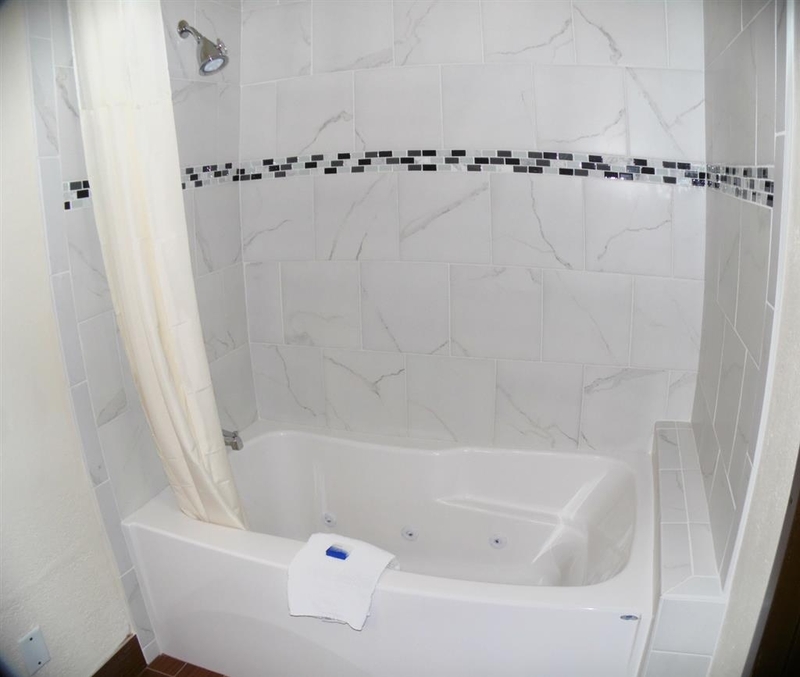 "Terrible Renovation, but Nice Sized Suites"
The pictures look much better than this hotel does in person. Yes, this hotel is renovated. But my goodness did they do a terrible job. From the paint to the lack of grout or adhesive in some areas...they paid too much to their contractors. Other than this, our particular room was clean and the bed were very comfortable. We were traveling with a 2 year old and an infant, which we set up in the living room section of the suite. Unfortunately the A/C in this part of the room didn't work, but the fan provided enough movement to keep them comfortable. Breakfast was ok, pretty standard "hot breakfast" fare, but the room was FREEZING. My eggs were cold before I could even think about eating them. The pool was an ok size but was pretty hot due to being completely in the sun. I do wish they had some kind of umbrellas, especially with little ones. The hotel is in a great location in Eliz City, very close to several restaurants, which is convenient. Overall, not a bad hotel, but I would MUCH rather stay at the Hampton Inn in Elizabeth City instead. I probably would not return here, especially for the price we paid. "The room was not very clean." The service was good. However the room was very dirty. The floors looked like they haven't been vacuumed for a very long time. I kept finding trash from previous guest everywhere I looked. The toilet bowl must not me on the list of things that they clean between guest either. The location is good. Seems like a nice town. Plenty of restaurants and amenities around. The continental breakfast was good. Multiple broken/half attached bathroom fixtures. Attached only by plumbing and flopped around while using. Toe/Finger nail clippings found on the carpet by my infant daughter. Parking lot was like the wild west as people were parallel parking in spaces that were obviously not meant for that or blaring their audio books in the parking lot. "Comfy stay in a clean and new hotel"
We parked right in front where our bikes were safely left outside overnight. Our family of 5 fit comfortably into a suite with 2 queen beds and a pull out sofa. Breakfast was good and we swam in the pool. We would stay here again! Stayed here while visiting the Outer Banks. A little far out but it is an easy drive to Kitty Hawk. Breakfast is ok. Scrambled eggs, bacon, sausage, waffles and a selection of cereal. Also had yogurt, apples, bananas, oranges and grapefruits. If you don't mind a drive each day, I would consider staying here. We were in town for a graduation. We were told to book here because it was close to the school and the graduate's home. When my husband called we were told that we had booked the last room that they had available for that weekend. 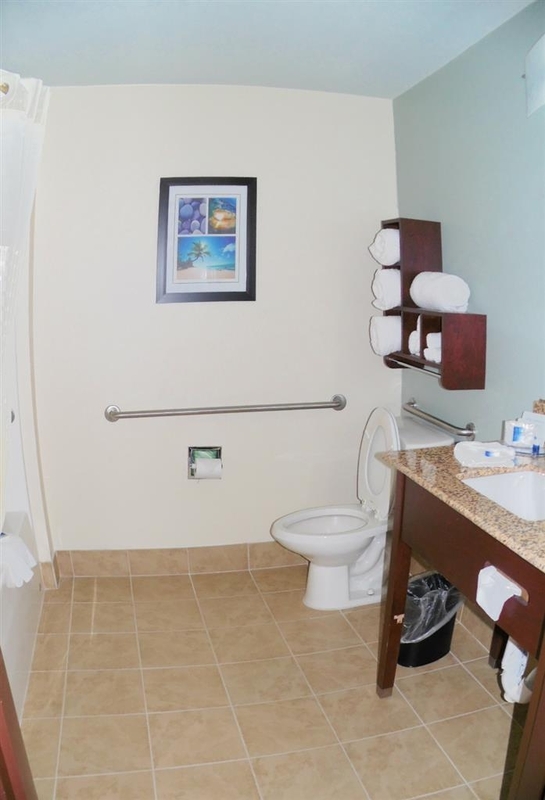 When we checked in we saw that they had a "sanitation rating" of 100%. The staff was very friendly. Sadly, that was the best part of the stay. The room (king) was average. The air conditioning blew "almost" cool air (as if it needed freon). The bathroom was TINY. We didn't even have the roller that holds the toilet paper on the roll (the toilet paper had just been left on top of the counter). The room and bathroom were straightened up but not clean by any means. Dirty is a deal breaker for me. (That sanitation rating was a bad joke.) Moral of the story is that we will find another hotel. Very disappointed to choose this location after a long day of travel. Appeared housekeeping decided to make up the bed with the previous guests sheets still on the bed. When we prepared for bed and turned down the sheets, was a disgusting surprise to find filthy, stained, sheets, body hair, and filthy pillowcases, There was no mistaking that these were NOT laundered. Staff promptly changed out all the bedding and apologized, but having to stand out in the hall for over an hr, after you've traveled with family all day is ridiculous. Should have immediately moved us to another CLEAN room. Very nice, renovated hotel. On our way to OBX but can't check in till the next day but don't want to drive 11 hours in one day either. Good stopping point as OBX is approximately 1 hour drive. Free breakfast. Shopping and nice restaurants in area. Front desk staff was very friendly. Reasonable rates. Highly recommend. "True Value for your Money + Great Staff"
In town for a family reunion and was given the choice of several hotels. Happy we chose BW. The staff was very kind, the rooms clean and the stay was great. Nice pool for the kids and the gym had new machines and weights.. Very nice choices for breakfast and it was included with your stay. "We passed through Elizabeth City on our way to the Outer Banks." Even with the Potato Festival underway, there wasn't a lot to do in town. The Best Western Plus was a pleasant surprise. Our room was relatively small, but very clean, neat and quiet - everything worked as expected. The pool was open, but the weather didn't fully cooperate. The breakfast was satisfying, waffle makers and some really good sausage were a hit. The attendant took time for conversation and a helping hand. I would definitely stay here again. 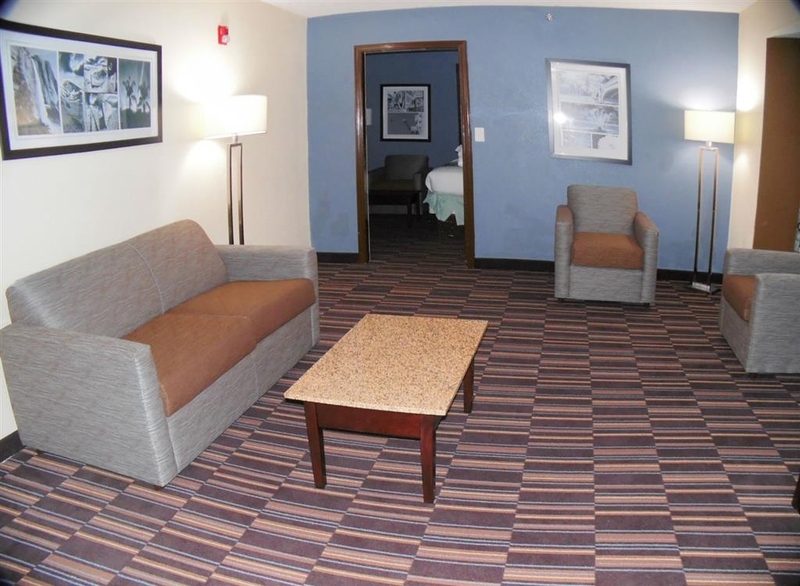 Staff was very professional and worked quickly to get my family and I in a room. The Lobby was neat and the hotel was very clean. I would recommend this place to anyone. I can't wait to book a room for my family next vacation! I am currently staying at this Best Western and I have not been disappointed so far. Checkin was quick and the ladies at the front desk were engaging and very nice. I knew coming here that there wasn't much to do in the area but that isn't why I picked to stay here. I am visiting a friend who lives in town and I don't mind driving to where I was am going to visit. It is very close to my friends house and it was a good deal for the time I am staying. So far I recommend the hotel as there is ample parking and the room is clean. I found that the previous reviews of having too much furniture in the room is inaccurate. There is a couch along with a desk and 2 side tables. 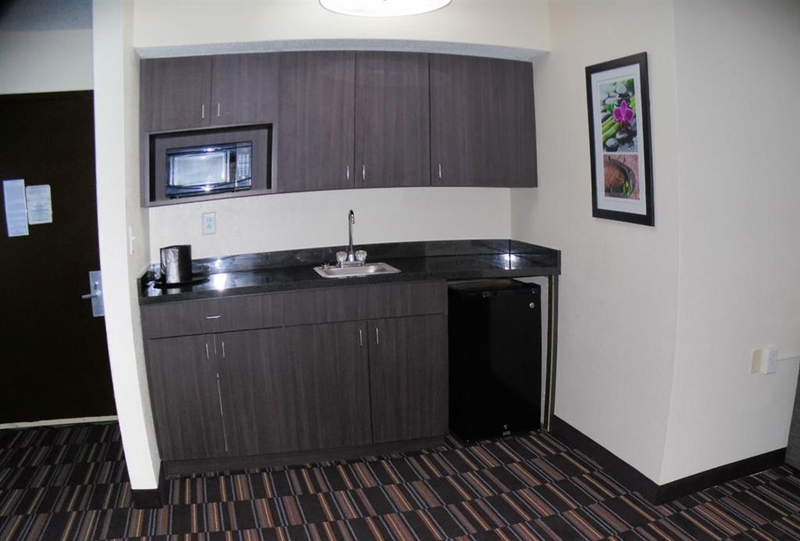 There is also a fridge and microwave. The hot breakfast in the morning is great!!! The selection is very good in my opinion. They have the normal cereal selection and breads but they also have Belgian waffles, scrambled eggs and sausage, oatmeal with all the fixings fresh fruit, a good selection of yogurt and juice, coffee and tea. They also have muffins which are fantastic. There are a lot of construction workers and military that I have seen stay here so you can notice the dirt footprints but I know that they vacuum the halls daily and it is only in the evenings when they come back that you can see it. The pool is currently not open yet so I can't comment on that. Again I highly recommend this hotel when you are in town. We had a great stay. Free wifi worked good. The room was clean. The breakfast was plentiful and full of choices, toast, cereal, waffles, eggs. Places to eat dinner were close and varied. Definitely stop. This location is on the edge of the congested part of the city but a very short drive to many restaurants and the main roads in the city. The bed was comfortable and AC worked great. The rooms are tight so it's great for one or two people. I think it was a former college dormitory hence it's room size. Lots of good options for breakfast with sturdy plates vs what has become so commonly found in hotels (foam - "I may fold in half any moment" plates) Coffee / Hot chocolate Tea available in the lobby around the clock. I look forward to my next return trip to Elizabeth City and returning to this hotel. Wonderful staff ! The staff was friendly and the quality of room was superb. We extended our stay for an additional night due to the atmosphere of the hotel. Great experience! Wonderful people! We will be staying again! Hotel was difficult to find to start with. The toilet was dirty - yellow ring. The bathroom lighting was awful and the floor needed washing. The bed was comfortable. The TV and internet were good. Not a place I would stay for the money again. Not up to Best Western Plus standards. "Microtel turned into Best Western"
The Best Western company did the best they could given the constraints of the bones from a Microtel. Still had the feel of being a little Microtelish (elevator had old writing on plastic covering). The rooms are small - very small. Fan didn't work. Staff was friendly. Breakfast was efficient. Fairly decent hotel for a good price nothing really bad to say, the beds are pretty comfortable, tried the free breakfast and That was ok as well .. I just can't stand the loud automatic fan that comes with flipping the lights on in the bathroom. "Clean and reasonably well maintained"
Clean and reasonably well maintained property, looks to have been updated fairly recently with new room decor and furnishings. Although the room layout was odd, with the coffee table square in the path of between bed and bath (hope you don't forget in the middle of the night). Overall, a nice enough property to stay a few nights, meets expectations. Good solid inn without issues or drama. Everything in good repair and very clean. Breakfast was well stocked and attended. A bit too much furniture in the he rooms. Table on the way to bathroom posed a hazard at night and needed to be moved. Friendly, helpful staff. Would definitely stay again. "Best Western Plus Over Priced"
This location is advertised as a Best Western Plus. The Plus must be the is the price and the wet carpet smell at ground level. 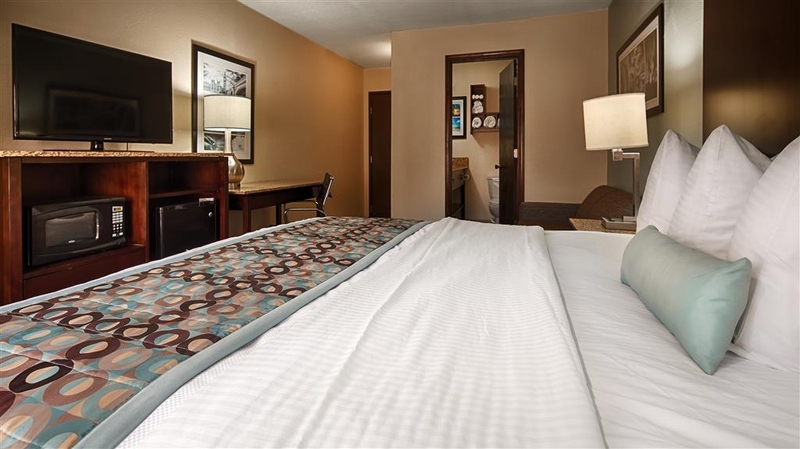 If you can afford to stay here, Check and see if there is Vacancy over at the Comfort Inn first and put the extra money you will save in your pocket PLUS a much nicer, LARGER room. I stay in a lot of motels in a year and you expect to pay more for desirable destinations like the beach or resort location not in Nowhere NC where the only thing they have is a Wal-Mart and couple of prison and lots of solar panels. Wonderfully upgraded hotel, but missed out on carpet and air conditioning upgrades. I never knew the brand hotel could dress so nicely and I was immediately impressed at check in; everything I could see was amazing. The smell the jumped out of the room was that of a dank location. If I had not drove 4 hours through rain, being exhausted and late at night, I would have asked for a new room or left completely if dealt another dud. The rest of the hotel was pleasant smelling. Location was close to restaurants and grocery shopping. I would try this hotel again if traveling alone and was arriving early enough to avoid a rotten apple. 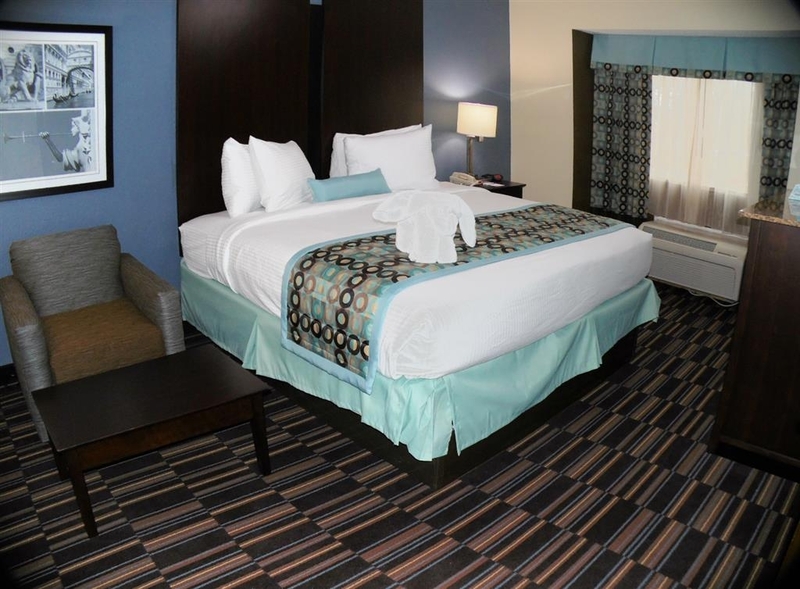 "A visit to Elizabeth City NC"
We had a pleasant experience on our overnight stay here. We found the staff most helpful, outgoing and got a good suggestion on where to dine. We had a good night's rest and started the day with a very nice breakfast. Would definitely stay here again if in the area. "Good value in an overpriced market." First of all the price for a relatively safe place to stay in Elizabeth City is ridiculous. Especially when you take in account that ocean front rooms are available an hour away cheaper. That being said the Best Western Elizabeth City was a great value. The room was clean, comfortable, and up to date. The rooms are small with minimum space to navigate around a King-sized bed. This was not an issue for me at all. However more picky people might find this a life altering hardship. The bed was very comfortable for me, but my Wife thought it was a bit hard. I had very limited interaction with the staff. The interactions I did have were pleasant and helpful. I didn't sample the breakfast but it smelled and looked delicious. I would stay here again. I would also recommend it to friends. Best Western is normally one of my go to hotels. I usually have a very positive experience, however this has not been the case here. I booked a 2 room queen suite, when I arrived one of the TV's had been removed and they did not have a replacement on hand, Their solution was to switch my rooms. The room also failed to haven linens for the sleeper sofa stocked in the room. I believe this is a trend in this hotel because the room I was moved into also had no linen but did have one pillow in the closet. Overall it is clean and the staff seem friendly and its not horrible I have just had better experiences at other Best Westerns. I have stayed in this hotel for 3 yrs during homecoming. I was pleased for the first couple of years. This year, I was disappointed. The room was musty and mildewed smelling. The shower curtain was dirty and too short causing water to spill on the floor. The shower head leaked and you had to play with it to get the water hot. I was not happy. "Funky rug design & limited proximity to surrounding business"
Booked this Best Western because first choice in the OBX was totally filled. Less than an hour away from OBX areas. Our stay was not remarkable. We all commented on the rather odd rug pattern in the hotel hallway areas. Rooms were functional and clean. Needed a room with a pull out couch bed. The pull out bed was horrible. TV in both rooms of our suite which was awesome. 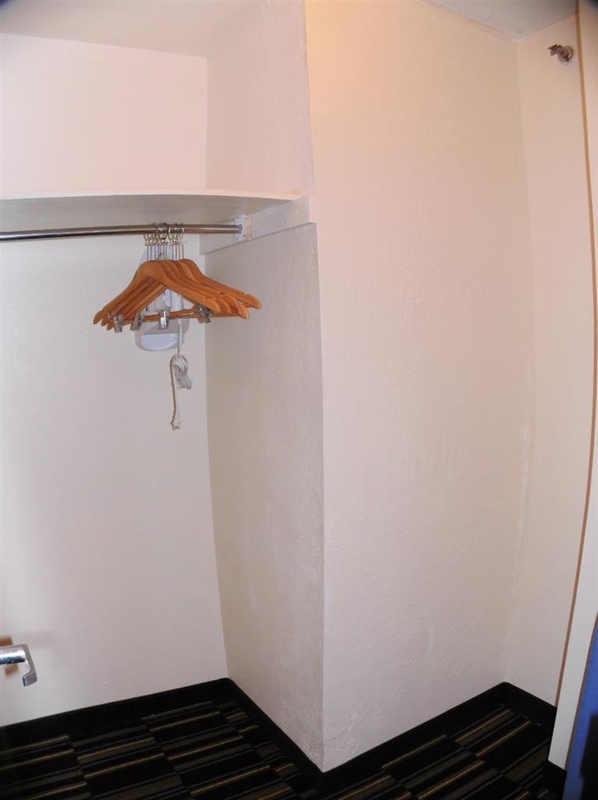 Elevator is slow and gets plenty of use which makes access to rooms a little bothersome. Wore a shirt from a brewery restaurant in Hawaii, and was scolded by an elderly lady in the elevator for promoting alcohol. Definitely a bible belt location. Breakfast was meager. For the size of the hotel, we expected a better breakfast line up. Ended up going elsewhere to eat. They do have a coffee urn near the check in. The coffee seemed to be in supply 24/7. My biggest issues with this place are that there is really nothing of note around this location. You have to drive a while to find restaurants, gas, etc. Also, for a Best Western Plus the hotel did not overwhelm me. As rewards members, our gift was 2 bottles of water....there were 4 of us. Overall, just an average stay. I would recommend this hotel if you cannot get closer to the beach areas and do not mind the 45 minute to 1 hr ride to the major attractions and restaurants. Wifi worked well without incident. This hotel is almost new. You can tell the new owners spent lots of money in remodeling. When you stay here it feels like your actually home. The rooms are nice. They are roomy. The employees are are all friendly. When I go home to visit I will stay here before I stay at the Hampton in or Fairfield Inn. It's very quiet. The rooms are very clean. Even if you need extra towels after hours they will get them for you. The also have hot breakfast in the morning. It's worth what you pay. this was the first Best Western that we stayed at using Corporate Lodging. The fact that you still earn points with Best Western rewards at some of the best prices offered through this check in service. the prices are about the same as the budget motels. the biggest difference is the comfort. iam hooked on Best Western! I travel a lot for work and during this week I stayed at this Best Western and I have to say, I will definitely recommend staying here. The rooms here are very nice, the bed was extremely comfortable and the hot shower was refreshing. Arrived late (around 8pm), on a Saturday night... Check in was quick and easy.... property and common areas look newer.... was given a room on the top floor (3rd)... Elevator dirty and dingy, as approaching the room, noticed blue paint tape all over the walls and doors in the hallway in our wing.... Upon entering, noticed a mold mildew smell... Later discovered this was due to the window being warped and unable to shut completely... Door to room had dents, and security latch was hanging by a thread.. Same for towel hook in bathroom, hanging by a thread.. Bathroom tub stained, probably 20 years old or more... also fan in bathroom had a 1 inch gap to the ceiling, you could see the mold... Fire alarm in room disabled, battery hanging out of position... furniture chipped.... Some of the counters had a sticky blotch... a few more negatives, but lets face it, that room was not ready for prime time.... Asked to be moved to another room and was told they were full up... was given a 10% discount, but doesn't cover the aggravation.... I will say though that the bed was very comfortable,(brand new), and the tv was loaded with channels all in crystal clear hd, but ultimately it was a 1 star room masquerading in a 3 star property... Kinda felt like an episode of to catch a contractor, where they left without completing the job.. I have stay at this hotel twice due to family functions. Its really nice. I have stayed in two types of rooms so far and they both was nice. The second time I stayed in a room with a king size bed, and a sofa it was very nice but the bedroom was tight. I do enjoy staying here. Very cozy and staff is friendly. I do have to say I stayed both time over a weekend but I do feel they are pricey. Front desk staff was very helpful and professional. 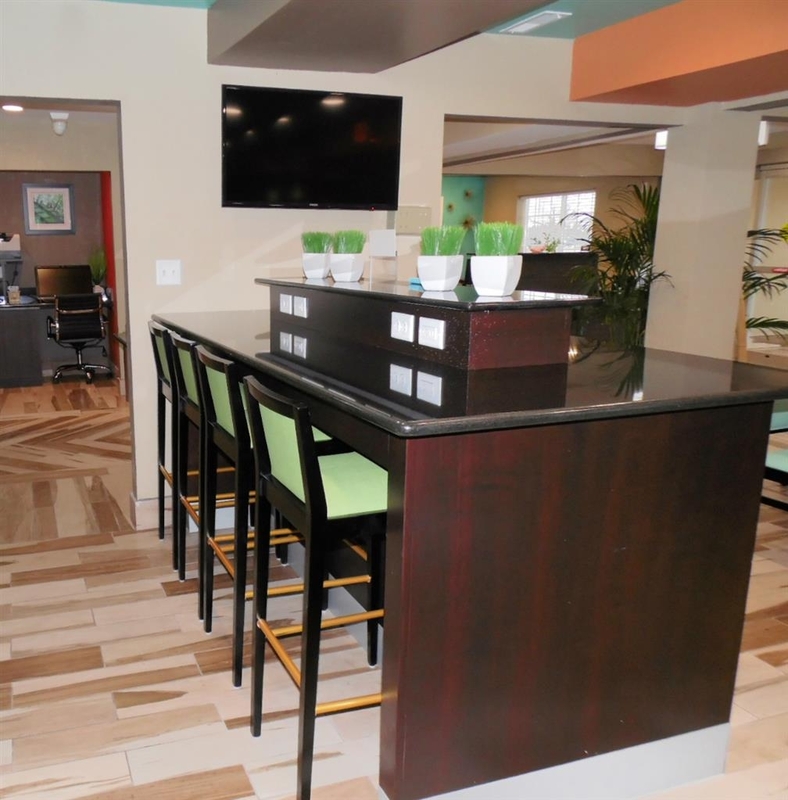 The decor was nice with very clean rooms and common areas. The breakfast was included and was actually pretty good. I thought the price was a bit high for the area but I did not compare it against other in the area. We stopped in Elizabeth City, North Carolina on our way to Carova Beach, North Carolina for vacation. 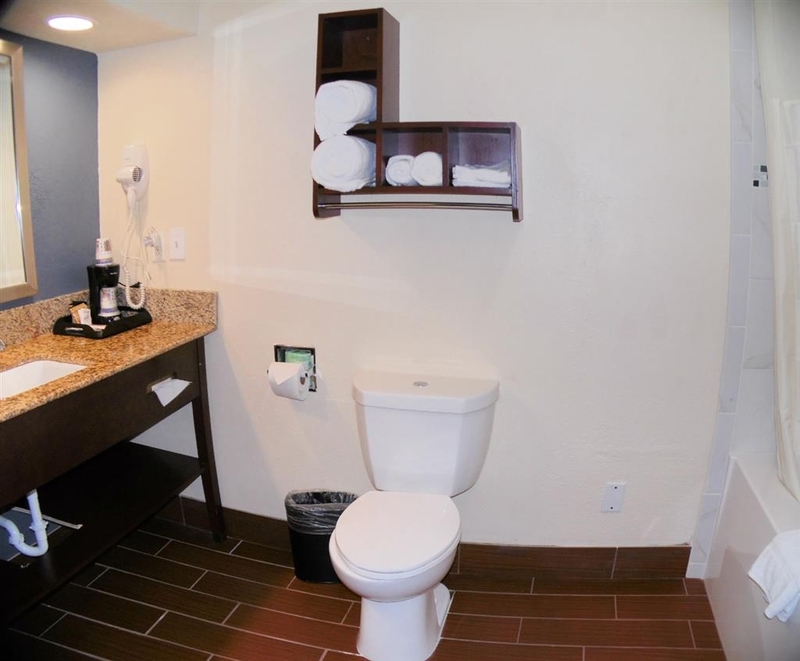 The Best Western Hotel was convenient and affordable. The rooms were comfortable, clean and roomy. The Staff was very nice and helpful. Breakfast was a variety of items and was delicious. 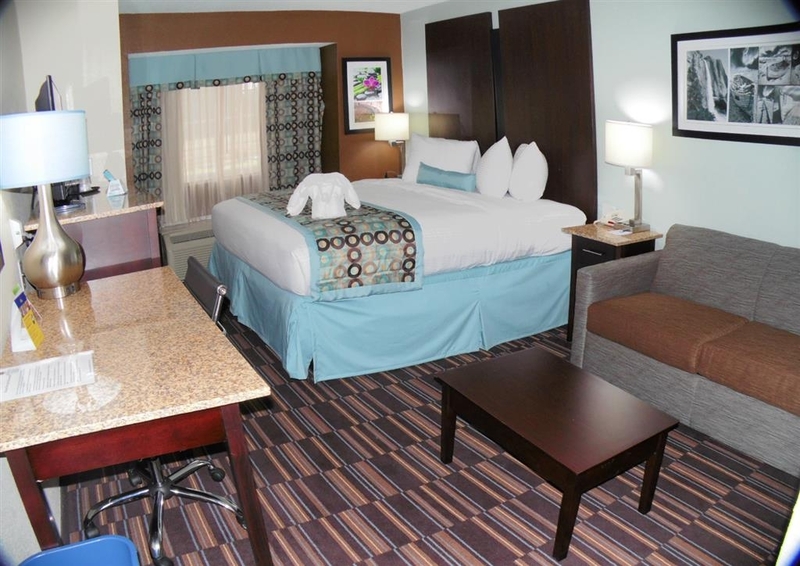 We enjoyed our short stay at the Best Western in Elizabeth City, North Carolina.